Portsmouth (/ˈpɔːrtsməθ/ (listen)) is a port city in Hampshire, England, with a total population of 205,400 residents. The city of Portsmouth is nicknamed Pompey and is mainly built on Portsea Island, a flat, low-lying island measuring 24 square kilometres (9 sq mi) in area, just off the south-east coast of Hampshire. Uniquely, Portsmouth is the only island city in the United Kingdom, and is the only city whose population density exceeds that of London. Portsmouth is located 70 miles (110 km) south-west of London and 19 miles (31 km) south-east of Southampton. With the surrounding towns of Gosport, Fareham, Havant and Waterlooville, Portsmouth forms the eastern half of the South Hampshire metropolitan area, which includes Southampton and Eastleigh in the western half. Portsmouth's history can be traced back to Roman times. A significant naval port for centuries, Portsmouth has the world's oldest dry dock. In the sixteenth century, Portsmouth was England's first line of defence during the French invasion of 1545. By the early nineteenth century, the world's first mass production line was set up in Portsmouth Dockyard's Block Mills, making it the most industrialised site in the world and birthplace of the Industrial Revolution. Portsmouth was also the most heavily fortified town in the world, and was considered "the world's greatest naval port" at the height of the British Empire throughout Pax Britannica. Defences known as the Palmerston Forts were built around Portsmouth in 1859 in anticipation of another invasion from continental Europe. In 1926, Portsmouth was officially elevated in status from a town to a city. The motto "Heaven's Light Our Guide" was registered to the City of Portsmouth in 1929. During the Second World War, the city of Portsmouth was a pivotal embarkation point for the D-Day landings and was bombed extensively in the Portsmouth Blitz, which resulted in the deaths of 930 people. In 1982, a large proportion of the task force dispatched to liberate the Falkland Islands deployed from the city's naval base. Her Majesty's Yacht Britannia left the city to oversee the transfer of Hong Kong in 1997, which marked for many the end of the empire. In 1997, Portsmouth became a Unitary Authority, with Portsmouth City Council gaining powers of a non-metropolitan county and district council combined, responsibilities previously held by Hampshire County Council. Portsmouth is one of the world's best known ports. HMNB Portsmouth is considered to be the home of the Royal Navy and is home to two-thirds of the UK's surface fleet. The city is home to some famous ships, including HMS Warrior, the Tudor carrack Mary Rose and Horatio Nelson's flagship, HMS Victory (the world's oldest naval ship still in commission). The former HMS Vernon naval shore establishment has been redeveloped as a retail park known as Gunwharf Quays. Portsmouth is among the few British cities with two cathedrals: the Anglican Cathedral of St Thomas and the Roman Catholic Cathedral of St John the Evangelist. The waterfront and Portsmouth Harbour are dominated by the Spinnaker Tower, one of the United Kingdom's tallest structures at 560 feet (170 m). Nearby Southsea is a seaside resort with a pier amusement park and medieval castle. Portsmouth F.C., the city's professional football club, play their home games at Fratton Park. The city has several mainline railway stations that connect to Brighton, Cardiff, London Victoria and London Waterloo amongst other lines in southern England. Portsmouth International Port is a commercial cruise ship and ferry port for international destinations. The port is the second busiest in the United Kingdom after Dover, handling around three million passengers a year. The city formerly had its own airport, Portsmouth Airport, until its closure in 1973. The University of Portsmouth enrols 23,000 students and is ranked among the world's best modern universities. Portsmouth is also the birthplace of author Charles Dickens and engineer Isambard Kingdom Brunel. The Romans built Portus Adurni, a fort, at nearby Portchester in the late third century. The city's Old English name "Portesmuða" is derived from port, meaning a haven, and muða, the mouth of a large river or estuary. The Anglo-Saxon Chronicle has a warrior called Port and his two sons killing a noble Briton in Portsmouth in 501. Winston Churchill, in his A History of the English-Speaking Peoples, says that Port was a pirate and he founded Portsmouth in 501. The south coast was vulnerable to Danish Viking invasions during the 8th and 9th centuries. In 787, it was assaulted and conquered by Danish pirates, and then during the reign of Æthelwulf, King of Wessex in 838, a Danish fleet landed between Portsmouth and Southampton and the surrounding area was plundered. In response, Æthelwulf sent Wulfherd and the governor of Dorsetshire to confront the Danes at Portsmouth, where most of their ships were docked. They were successful although Wulfherd was killed. In 1001, the Danes returned and pillaged Portsmouth and surrounding locations, threatening the English with extinction. The Danes were massacred by the survivors the following year and rebuilding began, although the town suffered further attacks until 1066. The Round Tower was built in 1418 to defend the entrance to Portsmouth Harbour. Portsmouth was not mentioned in the Domesday Survey of 1086, but Bocheland (Buckland), Copenore (Copnor), and Frodentone (Fratton) were. Some sources maintain it was founded in 1180 by the Anglo-Norman merchant Jean de Gisors. When King Henry II died in 1189, his son Richard I, who had spent most of his life in France, arrived in Portsmouth before he was crowned in London. When Richard returned from captivity in Austria in May 1194, he summoned a fleet of 100 ships and an army to the port. He granted the town a royal charter on 2 May, giving permission for an annual fifteen-day free market fair, weekly markets, and a local court to deal with minor matters, and exempted its inhabitants from paying an annual tax of £18. Richard granted the town the arms of Isaac Komnenos of Cyprus, whom he had defeated during the Third Crusade in 1191, reflecting a significant involvement of local soldiers, sailors, and vessels in the holy war. The 800 anniversary was celebrated in 1994 as the city's founding. King John reaffirmed the rights and privileges awarded by Richard I and established the permanent naval base. The first docks were built by William of Wrotham beginning in 1212. John summoned his earls, barons, and military advisers to the town to plan an invasion of Normandy. In 1229, after a declaration of war against France, Henry III assembled a force described as "one of the finest armies that had ever been raised in England" by historian Lake Allen. The invasion stalled and returned from France in October 1231. In 1242 Henry III summoned troops to invade Guienne, and in 1295 Edward I sent supplies for his army in France. By the following century, commercial interests had grown and its exports included wool, corn, grain, and livestock. Edward II ordered all ports on the south coast to assemble their largest vessels at Portsmouth to carry soldiers and horses to the Duchy of Aquitaine in 1324 to strengthen defences. In 1336 a French fleet under the command of David II of Scotland attacked the English Channel, ransacked the Isle of Wight and threatened the town. Concerned, Edward III instructed all maritime towns to build vessels and raise troops to rendezvous at Portsmouth. Two years later, a French fleet led by Nicholas Béhuchet raided Portsmouth, destroying much of the town. Only the stone-built church and hospital survived. After the raid, Edward III exempted the town from national taxes to aid reconstruction. Upon Edward III's death in 1377, his grandson Richard II was crowned, and the French landed in Portsmouth in the same year. The town was plundered and burnt, but its inhabitants fought back and defeated them, which led the French to retreat and raid towns in the West Country instead. A map of Portsmouth in around 1540. Henry V built the first permanent fortifications of Portsmouth. In 1416, a number of French ships blockaded Portsmouth, which housed ships that were set to invade Normandy. Instead, Henry gathered a fleet at Southampton and invaded the Norman coast in August of that year. Recognising the town's growing importance, he ordered a wooden Round Tower to be built at the mouth of the harbour, which was completed in 1426. Henry VII rebuilt the fortifications with stone, assisted Robert Brygandine and Sir Reginald Bray in the construction of the world's first dry dock, and raised the Square Tower in 1494. During his reign, Henry VII made Portsmouth a Royal Dock, and was England's only dockyard to be considered "national" at the time. Although King Alfred may have used Portsmouth to build ships as early as the 9th century, the first warship recorded as constructed in the town was the Sweepstake, built in the dry dock in 1497. In 1539, Henry VIII built Southsea Castle, financed by the Dissolution of the Monasteries, in anticipation of a French invasion. He also invested large sums of money into the town's dockyard, and expanded its boundaries to 8 acres (3.2 ha). Around this time a Tudor defensive boom stretched from the Round Tower to Fort Blockhouse in Gosport, as a protection to Portsmouth Harbour. In 1545, from Southsea Castle, he witnessed his flagship Mary Rose sink with the loss of about 500 lives, whilst going into action against the French fleet in the Battle of the Solent. Some historians believe that the Mary Rose turned too quickly and submerged her open gun ports, whereas others argue that it sank due to its poor design. Over the years, Portsmouth's fortifications were rebuilt and improved by successive monarchs. In 1563, Portsmouth suffered from an outbreak of a plague, resulting in about 300 deaths out of the town's population of 2000. In 1623, Charles I (then Prince of Wales) returned to Portsmouth from his travels in France and Spain. Five years later, Charles' unpopular military adviser, George Villiers, 1st Duke of Buckingham, was stabbed to death in an Old Portsmouth pub by war veteran John Felton. Felton never attempted to escape and was caught walking through the streets when soldiers confronted him, to which he responded: "I know that he is dead, for I had the force of forty men when I struck the blow". Felton was then hanged, and his body was chained to a gibbet on Southsea Common as a warning to others. The murder took place in the Greyhound public house on High Street, which is now private and called Buckingham House; it bears a commemorative plaque. Most residents, including the mayor, supported the parliamentarians during the English Civil War, although its military governor, Colonel Goring, supported the royalists. The town became a major base for the parliamentarian navy and was blockaded from the sea. Parliamentarian troops were sent to raid it by land in the Siege of Portsmouth; the guns of Southsea Castle were fired at the royalist garrison in the town. Across the harbour, parliamentarians in Gosport joined in the assault, with their guns damaging St Thomas's Church. On 5 September 1642, the remaining royalists in the garrison at the Square Tower were forced to surrender after Goring threatened to blow it up with gunpowder. In return, he and his garrison were allowed safe passage. Under the Commonwealth of England, Robert Blake used the harbour as his base during the First Anglo-Dutch War in 1652 and the Anglo Spanish War of 1654. He died within sight of the town returning from Cádiz. After the end of the Civil War in 1646, Portsmouth was among the first towns to declare Charles II as king and subsequently began to prosper. In 1650, the first ship to be built for more than 100 years, HMS Portsmouth, was launched. Between 1650 and 1660, twelve ships were built. After the restoration of Monarchy, Charles II married Catherine of Braganza in the Royal Garrison Church. During the latter half of the 17th century the town continued to grow; a new wharf was constructed in 1663 for military use, and in 1665 a mast pond was dug out. In 1684 a list of ships docked in Portsmouth gave evidence of its increasing national importance; the town was the only place of naval rendezvous in England at the time. Between 1667 and 1685 the town's fortifications were rebuilt; new walls were constructed with bastions and two moats were dug, making Portsmouth one of the most heavily fortified places in the world. In 1759, General James Wolfe sailed from the harbour to Canada on an expedition to capture Quebec which, though successful, cost him his life. His body was brought back to Portsmouth in November that year and received the highest naval and military honours. Two years later, on 30 May 1775, Captain James Cook arrived on board HMS Endeavour after circumnavigating the world. On 13 May 1787, eleven ships left to establish the first European colony in Australia, marking the beginning of prisoner transportation, and in the same year, Captain William Bligh of HMS Bounty set sail from the harbour. After the mutiny on the Bounty on 28 April 1789, HMS Pandora was dispatched from Portsmouth to bring back the mutineers for trial. The court martial opened on 12 September 1792 on board HMS Duke in Portsmouth Harbour – of the remaining ten men, three were sentenced to death. In 1789, a chapel was erected in Prince George's Street and was dedicated to St John by the Bishop of Winchester. Around this time, a bill was passed in the House of Commons regarding the creation of a canal to link Portsmouth to Chichester, but the project was abandoned. The city's nickname Pompey is thought to have derived from the log entry of Portsmouth Point, contracted to "Po'm.P." (Po'rtsmouth P.oint) as ships entered the harbour. Navigational charts use the contraction. However, a historian argues that the name Pompey may have been brought back from a group of Portsmouth-based sailors who visited Pompey's Pillar in Alexandria, Egypt, in around 1781. Another theory is that it is named after the harbour's guardship, Pompee, a 74-gun French ship of the line captured in 1793. The borough's coat of arms is attested in the early 19th century, as Azure a crescent or, surmounted by an estoile of eight points of the last This design is apparently based on seals of the mayoralty used in the 18th century. HMS Warrior (launched in 1860) has been restored to its original Victorian condition. Marc Isambard Brunel established the world's first mass production line at Portsmouth Block Mills making pulley blocks for rigging on the navy's ships. The first machines were installed in January 1803 and the final set for large blocks in March 1805. In 1808, the mills produced 130,000 blocks. By the turn of the 19th century, the town had the largest industrial site in the world with a workforce of 8000 and an annual budget of £570,000. In 1805, Admiral Nelson left Portsmouth to command the fleet that defeated the Franco-Spanish at the Battle of Trafalgar. Before departing, Nelson told the crew of HMS Victory and workers in the dockyard that "England expects every man will do his duty". The Royal Navy's reliance on Portsmouth led to it becoming the most fortified city in the world. A network of Palmerston Forts were built around the town as part of a programme led by Prime Minister Lord Palmerston to defend British military bases from an inland attack. The forts were nicknamed "Palmerston's Follies" due to the fact that their armaments were pointed inland and not out to sea. From 1808 the Royal Navy's West Africa Squadron, tasked with stopping the slave trade, operated out of Portsmouth. In April 1811 the Portsea Island Company constructed the first piped water supply to upper and middle-class houses. It supplied water to approximately 4500 of the 14,000 houses, generating an income £5000 a year. HMS Victory's active career ended in 1812, when she was moored in Portsmouth Harbour and used as a depot ship. The town of Gosport contributed £75 a year towards the ship's maintenance. In 1818, John Pounds began teaching working class children in the country's first ragged school. In 1820, the Portsea Improvement Commissioners installed gas street lighting throughout the town, followed by Old Portsmouth three years later. During the 19th century, Portsmouth grew and expanded across Portsea Island. By the 1860s Buckland had been merged into the expanding town, and by the next decade Fratton and Stamshaw had also been incorporated. Between 1865 and 1870 the council built sewers after more than 800 people died in a cholera epidemic. A bylaw stated that any house within 100 feet (30 m) of a sewer had to be connected to it. By 1871 the population had risen to 100,000, although the national census at that time gave the population as 113,569. A working-class suburb was constructed in the 1870s when around 1,820 houses were built on land owned by a Mr Somers. The suburb became Somerstown. Despite public health improvements, 514 people died in a smallpox epidemic in 1872. That year, on 21 December, the Challenger expedition was launched from Portsmouth, embarking on a 68,890-nautical-mile (127,580 km) circumnavigation of the globe for scientific research. At the turn of the 20th century, Portsmouth was considered "the world's greatest naval port" when the British Empire was at its height of power, covering a quarter of Earth's total land area and 458 million people. In 1900, Portsmouth Dockyard employed 8000 men – a figure which more than doubled to 23,000 people during the First World War. On 1 October 1916, Portsmouth was bombed by a Zeppelin airship. Although the Oberste Heeresleitung (German Supreme Army Command) stated that the town was "lavishly bombarded with good results", there were no reports of any bombs being dropped in the area. Another source asserted that the bombs were mistakenly dropped into the harbour rather than the dockyard. Throughout the war, around 1200 ships were refitted in the dockyard, making it one of the most strategic ports in the empire at the time. Portsmouth was granted city status in 1926, following a long campaign by the borough council. The application was made on the grounds that it was the "first naval port of the kingdom". In 1929, the city council added the motto "Heaven's Light Our Guide" to the medieval coat of arms. Except for the celestial objects in the arms, the motto was that of the Star of India, referring to the troopships bound for British India that left from the port. The crest and supporters are based on those of the royal arms, but altered to show the city's maritime connections: the lions and unicorn have been given fish tails, and a naval crown placed around the unicorn. Around the unicorn is wrapped a representation of the Tudor defensive boom which stretched across Portsmouth Harbour. We are bruised but we are not daunted, and we are still as determined as ever to stand side by side with other cities who have felt the blast of the enemy, and we shall, with them, persevere with an unflagging spirit towards a conclusive and decisive victory. Portsmouth Harbour was a vital military embarkation point for the D-Day landings on 6 June 1944. Southwick House, just to the north of the city, was the headquarters of the Supreme Allied Commander, US General Dwight D. Eisenhower. On 15 July 1944 a V-1 flying bomb hit Newcomen Road, killing 15 people. Much of the city's housing stock was damaged during the war. The wreckage was cleared in an attempt to improve the quality of dwellings after the war, though before permanent accommodation could be built, Portsmouth City Council built prefabs for those who had lost their homes. Between 1945 and 1947, more than 700 prefab houses were constructed – some were erected over bomb sites. The first permanent houses were built away from the city centre to new developments such as Paulsgrove and Leigh Park, with construction of council estates in Paulsgrove being completed in 1953. In Leigh Park, the first housing estates were completed in 1949, though building work in the area continued until 1974. Developers still occasionally find unexploded bombs in the area, such as on the site of the destroyed Hippodrome theatre in 1984. Despite improvements made by the city council to build new accommodation, a survey made in 1955 concluded that 7000 houses in Portsmouth were unfit for human habitation. Following a controversial decision, a whole section of central Portsmouth, including Landport, Somerstown and Buckland, was demolished and replaced by council housing during the 1960s and early 1970s. The success of the project and the quality of the 70s homes are debatable. Her Majesty's Yacht Britannia in Portsmouth Harbour during the 50th anniversary of the D-Day Landings in 1994. The masts of HMS Victory can be seen in the background. Portsmouth was affected by the British Empire's decline in the latter half of the 20th century. Shipbuilding jobs fell from 46% of workforce in 1951 to 14% in 1966, drastically reducing the manpower in the dockyard. The city council attempted to create new work; an industrial estate was built in Fratton in 1948, and others were built at Paulsgrove and Farlington in the 1950s and 1960s, respectively. Traditional industries such as brewing and corset making disappeared during this time, though electrical engineering became a major employer. Despite the cutbacks made to traditional sectors, Portsmouth still remained an attractive place for industry. In 1968, Zurich Insurance Group moved their UK headquarters to the city, with IBM relocating their European headquarters in 1979. The population of the city had dropped from approximately 200,000 to 177,142 by the end of the 1960s. In the early 1980s, then Defence Secretary John Nott concluded that of the four home dockyards, both Portsmouth and Chatham would be closed. However, Portsmouth City Council won a concession, and rather than face closure, the dockyard was downgraded to a naval base. On 2 April 1982, Argentine forces invaded two British territories in the South Atlantic: the Falkland Islands and South Georgia and the South Sandwich Islands. The British government's response was to dispatch a naval task force, and on 5 April, the aircraft carriers HMS Hermes and HMS Invincible sailed from Portsmouth for the South Atlantic. The successful outcome of the war had reaffirmed Portsmouth's significance as a naval port and importance to the defence of British interests. In January 1997, Her Majesty's Yacht Britannia embarked from the city on her final voyage to oversee the transfer of sovereignty over Hong Kong, which marked for many the end of the empire. She was later decommissioned on 11 December that year at Portsmouth Naval Base in the presence of the Queen, the Duke of Edinburgh, and twelve senior members of the Royal Family. In 2001, redevelopment of the naval shore establishment HMS Vernon began as a complex of retail outlets, clubs, pubs, and a large shopping centre known as Gunwharf Quays. In 2003, construction of the 552 feet (168 m) tall Spinnaker Tower began at Gunwharf Quays with sponsorship from the National Lottery. In late 2004, the Tricorn Centre, dubbed "the ugliest building in the UK" by the BBC, was demolished after years of debate over the expense of demolition, and controversy as to whether it was worth preserving as an example of 1960s brutalist architecture. It was designed by Owen Luder as part of a project to "revitalise" Portsmouth in the 1960s, consisting of a shopping centre, market, nightclubs, and a multi-storey car park. In 2005 the city celebrated the 200th anniversary of the Battle of Trafalgar, with Queen Elizabeth II being present at a formal fleet review and a staged mock battle. The naval base continues to be home to two-thirds of the surface fleet. By road, Portsmouth lies 73.5 miles (118.3 km) from Central London, 49.5 miles (79.7 km) west of Brighton, and 22.3 miles (35.9 km) east of Southampton. Portsmouth is situated primarily on Portsea Island and is the United Kingdom's only island city, although parts of it have expanded onto the mainland. Gosport forms a borough in its own right immediately to the west. The island is separated from the mainland by Portsbridge Creek which is crossed by three road bridges (the M275 motorway, the A3 road, and the A2030 road), a railway bridge, and two footbridges. Portsea Island, which forms part of the Hampshire Basin, is low-lying: the majority of its surface area on the island is less than 3 metres (9.8 ft) above sea level. The highest natural elevation on Portsea Island is the road junction Kingston Cross, at 21 feet (6.4 m). Old Portsmouth forms the oldest part of the city in the south-west part of Portsea Island, and includes Portsmouth Point, historically nicknamed as Spice Island. The main channel entering Portsmouth Harbour, which lies to the west of Portsea Island, passes between Old Portsmouth and Gosport. Within Portsmouth Harbour are a series of lakes, including Fountain Lake near the harbour, Portchester Lake in the central south, Brick Kiln Lake and Tipner to the east, and Bombketch and Spider Lakes to the west. In the channel further to the northwest, around Portchester, are Wicor, Cams, and Great Cams Lakes. The large tidal inlet of Langstone Harbour lies to the east of Portsea Island. In the northern part, off the coast of Farlington, is the Farlington Marshes, a 125-hectare (308-acre) grazing marsh and saline lagoon. One of the oldest local reserves in the county, built from reclaimed land in 1771, it provides an important habitat for migratory wildfowl and waders. To the south of Portsmouth are the waters of Spithead, the wider Solent, and the Isle of Wight. The southern coast of the city was historically fortified by the Round Tower, the Square Tower, Southsea Castle, Lumps Fort and Fort Cumberland. Four sea forts were built in the Solent to protect Portsmouth by Lord Palmerston, these are named Spitbank Fort, St Helens Fort, Horse Sand Fort and No Mans Land Fort. The seaside resort of Southsea is situated to the south of Portsea Island, and to the east lies the area known as Eastney. Eastney Lake covered nearly 170 acres (69 hectares) in 1626. To the north of Eastney is the residential district of Milton and an area of reclaimed land now known as Milton Common (formerly Milton Lake), described as a "flat scrubby land with a series of freshwater lakes". Further north on the east coast is the residential district of Baffins, featuring Great Salterns recreation ground and golf course, which forms an area around Portsmouth College. The Hilsea Lines are a series of defunct fortifications on the north coast of the island which border Portsbridge Creek and the mainland. Portsdown Hill dominates the skyline in the northern part of the city, and contains several large Palmerston Forts,[a] such as Fort Fareham, Fort Wallington, Fort Nelson, Fort Southwick, Fort Widley, and Fort Purbrook. Portsdown Hill is formed by a large band of chalk, while the rest of Portsea Island is composed of layers of London Clay and sand (part of the Bagshot Formation), formed principally during the late and early Eocene Epoch. Northern areas of the city include Stamshaw, Hilsea and Copnor, Cosham, Drayton, Farlington, and Port Solent. Other districts in Portsmouth include North End and Fratton. The west of the city is mainly council estates such as Buckland, Landport, and Portsea. These were built to replace Victorian terraces destroyed by bombing in the Second World War. After the war the 2,000 acres (810 ha) estate of Leigh Park was built to solve the chronic housing shortage during the post-war reconstruction. Since the early 2000s the estate has been entirely under the jurisdiction of Havant Borough Council, but Portsmouth City Council remains the landlord of these properties, making it the biggest landowner in Havant Borough. The city's main station, Portsmouth and Southsea railway station, is located in the city centre, close to the Guildhall and the Civic Offices. Just to the south of the Guildhall is Guildhall Walk, a nightlife area with many pubs and clubs. Edinburgh Road contains the city's Roman Catholic cathedral and Victoria Park, a 15 acres (6.1 ha) park which opened in 1878. Panorama of Portsmouth from Portsdown Hill. To the left lies Langstone Harbour along with Hayling Island, and to the right lies Portsmouth Harbour. Being located on the south coast of England, Portsmouth has a mild oceanic climate, receiving more sunshine than most of the British Isles. During winter, frosts are light and short-lived and snow quite rare, with temperatures rarely dropping below freezing, as the city is surrounded by water and densely populated, and Portsdown Hill protects the city from cold northerly winds. The average maximum temperature in January is 10 °C (50 °F) with the average minimum being 5 °C (41 °F). The lowest temperature recorded is −8 °C (18 °F). In summer a temperature of 30 °C (86 °F) can occasionally be attained, particularly in more sheltered spots. The average maximum temperature in July is 22 °C (72 °F), with the average minimum being 15 °C (59 °F). The highest temperature recorded is 35 °C (95 °F). As it is located on the coast in South East England, the city receives more sunshine per annum than most of the UK. The city gets around 645 millimetres (25.4 in) of rain a year, with a minimum of 1 mm (0.04 in) of rain reported on 103 days a year. Portsmouth, as the most densely populated city in the United Kingdom, is the only city whose population density exceeds that of London. As of the 2011 census, the city had 205,400 residents. This equates to 5,100 people living in every square kilometre (0.4 sq. mi. ), which is eleven times more than the regional average of 440 people per square kilometre and more than London, which has 4,900 people per square kilometre. The city used to be even more densely populated, with the 1951 census showing a population of 233,545. In a reversal of that decrease, the population of the city has been gradually increasing since the 1990s. With about 860,000 residents, the South Hampshire built-up area is the fifth-largest urban area in England and the largest in South East England, forming the centre of one of the United Kingdom's most populous metropolitan areas. The city is predominantly white in terms of ethnicity, with 91.8% of the population belonging to this ethnic group. Portsmouth's long association with the Royal Navy means that it represents one of the most diverse cities in terms of the peoples of the British Isles. Similarly, some of the largest and most well-established non-white communities have their roots with the Royal Navy, most notably the large Chinese community, principally from British Hong Kong. Portsmouth's long industrial history in support of the Royal Navy has seen many people from across the British Isles move to Portsmouth to work in the factories and docks, the largest of these groups being Irish Catholics. [b] According to 2011 census, the ethnic breakdown of Portsmouth's population is as follows: 84.0% White British, 3.8% Other White, 1.3% Chinese, 1.4% Indian, 0.5% Mixed-Race, 1.8% Bangladeshi, 0.5% Other ethnic group, 1.4% Black African, 0.5% White Irish, 1.3% Other Asian, 0.3% Pakistani, 0.3% Black Caribbean and 0.1% Other Black. The neo-classical Portsmouth Guildhall and surrounding Civic Offices are the centre of government in the city. The city is administered by Portsmouth City Council, a unitary authority which is responsible for local affairs. Portsmouth was granted its first charter in 1194. In the early 20th century, the boundaries were extended to include the whole of Portsea Island; they were further extended in 1920 and 1932, taking in areas of the mainland and adjacent villages which included Drayton and Farlington. From 1 April 1974 it formed the second tier of local government below Hampshire County Council; however, Portsmouth, along with Southampton, became administratively independent of Hampshire with the creation of the unitary authority on 1 April 1997. The city is divided into two parliamentary constituencies, Portsmouth South and Portsmouth North, represented in the House of Commons by, respectively, Stephen Morgan, of the Labour Party, and Penny Mordaunt, of the Conservative Party. The city council is made up of 42 councillors. After the May 2018 local elections, the Liberal Democrats formed a minority administration with 16 councillors, supported by Labour with 5 councillors. The Conservatives have 19, including the Lord Mayor, Lee Mason. There are also two independent councillors. Councillors are returned from 14 wards, with each ward having three councillors and a four-year term. The leader of the council is the Liberal Democrat, Gerald Vernon-Jackson. The position of Lord Mayor of Portsmouth is usually held for a one-year period. The council is based in the Civic Offices, which house departments such as tax support, housing benefits, resident services, and municipal functions. They are situated in Guildhall Square, along with Portsmouth Guildhall and Portsmouth Central Library. The Guildhall is a symbol of Portsmouth, serving principally as a cultural venue. It was designed by Leeds-based architect William Hill, who first started constructing it in the neo-classical style in 1873 at the cost of £140,000. The Guildhall was opened to the public in 1890. Portsmouth Continental Ferry Port serves as one of the city's major industries. A tenth of the city's workforce is employed at Portsmouth Naval Dockyard, which is directly linked to the city's biggest industry, defence, with the headquarters of BAE Systems Surface Ships located in the city. BAE's Portsmouth shipyard has been awarded a share of the construction work on the two new Queen Elizabeth-class aircraft carriers, with both aircraft carriers set to enter Portsmouth Harbour upon completion. A £100 million contract was signed to develop the facilities at Portsmouth that will be necessary to support the vessels. There is also a major ferry port that handles both passengers and cargo, and the city has a dedicated fishing fleet consisting of 20 to 30 boats that operate out of the camber docks in Camber Quay, Old Portsmouth. They land fresh fish and shellfish daily, most of which is sold at the quayside fish market. The city is host to the European headquarters of IBM and, until 2007, the UK headquarters of Zurich Financial Services. In the city centre, shopping is centred on Commercial Road and the 1980s Cascades Shopping Centre, with over 100 high street shops between them. Approximately 185,000 to 230,000 people use the Cascades Shopping Centre each week. Recent redevelopment has created new shopping areas, including the upmarket Gunwharf Quays—a redevelopment of the naval shore establishment HMS Vernon— containing fashion stores, restaurants, and a cinema, and the Historic Dockyard, which caters to the tourist sector and holds an annual Victorian Christmas market. Ocean Retail Park sits on the north-eastern side of Portsea Island and was built on land previously occupied by a Metal Box factory in September 1985. Portsmouth will be the home port of the two Queen Elizabeth-class aircraft carriers, the largest ships ever built by the Royal Navy. Development at Gunwharf Quays continued until 2007 with the completion of the 330-foot (101 m) tall No. 1 Gunwharf Quays residential tower (nicknamed 'Lipstick Tower'). The development of the former Brickwoods Brewery site included the construction of a 22-storey tower known as the Admiralty Quarter Tower, the tallest in a complex of mostly low-rise residential buildings. A new 25-storey tower named 'Number One Portsmouth', was made public at the end of October 2008, which has been proposed at a height of 330 feet (101 m), and will stand opposite Portsmouth & Southsea station. As of August 2009, internal demolition has started on the building that currently occupies the site. A new student accommodation tower, nicknamed 'The Blade', has started construction on the site of the old Victoria swimming baths, on the edge of Victoria Park. The tower will stand over 300 feet (91 m), and will become Portsmouth's second tallest structure after the Spinnaker Tower. In April 2007, Portsmouth F.C. announced plans to move away from Fratton Park to a new stadium situated on a piece of reclaimed land beside the Historic Dockyard, nicknamed Portsmouth Dockland Stadium. The £600 million mixed-use development, designed by architects Herzog & de Meuron, would also include 1500 harbourside apartments as well as shops and offices. The scheme attracted criticism due to its large size and location, with some officials saying that it would interfere with harbour operations. The £600 million project for a new stadium was rejected by the city council due to the financial crisis of 2008. Portsmouth will help build, and be the home port of, two new Queen Elizabeth-class aircraft carriers: HMS Queen Elizabeth and HMS Prince of Wales, the largest ships ever built by the Royal Navy. The supercarriers were first ordered by then Defence Secretary Des Browne on 25 July 2007. Construction of both ships took place in the Firth of Forth at Rosyth Dockyard and BAE Systems Surface Ships in Glasgow, Babcock International at Rosyth, and at HMNB Portsmouth. It was announced by the government prior to the Scottish Independence Referendum that military shipbuilding would end in Portsmouth, with all UK surface warship shipbuilding to be focused instead at the two older BAE facilities in Glasgow. This was heavily criticised at the time as a political rather than economic decision to help the "No campaign" for Scotland to remain a part of the United Kingdom. Portsmouth has several theatres: the New Theatre Royal in Guildhall Walk, near the city centre, which specialises in professional drama, and the newly restored Kings Theatre in Southsea, which features amateur musicals as well a number of national tours. Another theatre is the Groundlings Theatre, which was built in 1784 and is housed in The Old Beneficial School, Portsea. New Prince's Theatre and Southsea's Kings Theatre were both designed by Victorian architect and entrepreneur Frank Matcham. The city also has three established music venues: the Guildhall, The Wedgewood Rooms (which includes a smaller venue, Edge of the Wedge), and Portsmouth Pyramids Centre. Portsmouth Guildhall, another theatrical venue, is one of the largest events venue in South East England, with a seating capacity of 2500. For many years a series of symphony concerts has been presented at the Guildhall by the Bournemouth Symphony Orchestra. In the 1970s the Portsmouth Sinfonia approached classical music from a different angle: the Sinfonia often recruited players that had no musical training or, if they were musicians, ones that chose to play an instrument that was entirely new to them. The Portsmouth Summer Show is held at King George's Fields. The 2016 event was held in the last weekend of April, and featured cover bands such as the Silver Beatles, the Bog Rolling Stones, and Fleetingwood Mac. Numerous musical works are set in the city. Portsmouth Point is an overture for orchestra by the English composer William Walton in 1925. The work was inspired by Thomas Rowlandson's etching depicting Portsmouth Point, otherwise known as "Spice Island" in Old Portsmouth. The overture was used for the BBC Proms Concert in 2007. H.M.S. Pinafore is a comic opera in two acts set in Portsmouth Harbour, with music by Arthur Sullivan and libretto by W. S. Gilbert. John Cranko's 1951 ballet Pineapple Poll, which features the operetta music of The Bumboat Woman's Story by Gilbert and Sullivan, is also set in Portsmouth. Portsmouth hosts yearly remembrances of the D-Day landings, which veterans from Allied and Commonwealth nations attend. The city played a major part in the 50th D-Day anniversary in 1994; visitors included then-US President Bill Clinton, Australian Prime Minister Paul Keating, King Harald V of Norway, French president François Mitterrand, New Zealand Prime Minister Jim Bolger, Canadian Prime Minister Jean Chrétien, Prime Minister John Major, the Queen and the Duke of Edinburgh. The Portsmouth International Kite Festival is organised annually by Portsmouth City Council and The Kite Society of Great Britain. It celebrated its 25th anniversary in 2016. In literature, Portsmouth is the chief location for Jonathan Meades' 1993 novel Pompey, in which it is inhabited largely by incestuous and necrophiliac criminals. Since the release of his novel, Meades has presented a TV programme documenting Victorian architecture in Portsmouth Dockyard. In Jane Austen's novel Mansfield Park, Portsmouth is the hometown of the main character Fanny Price, and is the setting of most of the closing chapters of the novel. In Charles Dickens' novel The Life and Adventures of Nicholas Nickleby, main protagonists Nicholas and Smike make their way to Portsmouth and get involved in a theatrical troupe. In Patrick O'Brian's nautical historical Aubrey-Maturin series, Portsmouth is most often the port from which Captain Jack Aubrey's ships sail. Victorian novelist and historian Sir Walter Besant documented his childhood in the town in the 1840s in By Celia's Arbour: A Tale of Portsmouth Town. The book is notable for its precise descriptions of the town before the defensive walls were removed. Southsea features in The History of Mr Polly by H. G. Wells under the fictional name of Port Burdock, which he describes as "one of the three townships that are grouped around the Port Burdock naval dockyards". High fantasy author Neil Gaiman also sets his graphic novel The Tragical Comedy or Comical Tragedy of Mr. Punch around Southsea, Gaiman having grown up in Portsmouth. A street along the seafront in Southsea was renamed "The Ocean at the End of the Lane" by the city council in honour of his novel of the same name. Notable crime novels set in Portsmouth and the surrounding area include Graham Hurley's D.I. Faraday/D.C. Winter novels and C. J. Sansom's Tudor crime novel Heartstone, with the latter including references to the famous warship Mary Rose and descriptions of Tudor life in the town. A collection of fantastical short stories, Portsmouth Fairy Tales for Grown Ups, was published in 2014. It uses locations around Portsmouth for the stories, and includes writing by crime novelists William Sutton, Diana Bretherick, and others. The University of Portsmouth was founded in 1992 as a new university from the existing Portsmouth Polytechnic; it has 20,000 students on campus as of 2016. The university was ranked among the top 100 modern universities in the world in April 2015. As of 2013, the university had approximately 23,000 students and more than 2500 staff. Several local colleges also have the power to award Higher National Diplomas, including Highbury College, which specialises in vocational education, and Portsmouth College, which offers various academic courses in the city. Both Admiral Lord Nelson School and Miltoncross Academy were built in the late 1990s to meet the demand of a growing school-age population. Following the cancellation of the national building programme for schools, these redevelopments did not go ahead. In 2009, only two schools in the city were judged "inadequate", whereas 29 of the city's 63 schools were considered "no longer good enough" by Ofsted. Before being taken over by Ark Schools and becoming a Charter Academy, St Luke's Church of England secondary school was, in terms of GCSE achievement, one of the worst schools in the country. It was also criticised by officials for its behavioural standards – reports were made of students repeatedly throwing chairs at teachers. Since becoming an academy in 2009, the schools have significantly improved; 69% of students achieved five GCSEs at grades A* – C including English and mathematics. Charter Academy operates its intake policy as a standard comprehensive taking from its catchment area rather than selecting on religious background. There is also a cohort of independent schools within the city – the oldest, founded in 1732 by the Mayor of Portsmouth, is the Portsmouth Grammar School, which has been rated as one of the best private schools in the country. The Portsmouth High School, a member of the Girls Day School Trust, was ranked one of the top private schools for girls in the UK by A-level results in 2013. Other independent schools in the city include Mayville High School, founded in 1897, and St John's College, an independent Catholic boarding school. HMS Warrior (right) and the Spinnaker Tower (left) are among the city's main attractions. Many of the city's former defences are now museums, or venues for hosting events. Several of the Victorian era forts on Portsdown Hill are now tourist attractions: Fort Nelson, which lies on the summit of Portsdown Hill, is home to the Royal Armouries museum. The Tudor era Southsea Castle has a small museum, and much of the seafront defences leading up to the Round Tower are open to the public. The castle was withdrawn from active service in 1960 and was subsequently purchased by Portsmouth City Council. The southern part of the Royal Marines' Eastney Barracks is now the Royal Marines Museum, and was opened to the public under the National Heritage Act 1983. The museum was awarded a £14 million grant from the National Lottery Fund, and is set to relocate to the Portsmouth Historic Dockyard in 2019. The birthplace of Charles Dickens at Mile End Terrace, is now the Charles Dickens Birthplace Museum. The four-storey red brick building became a Grade I listed building in 1953. Other tourist attractions include the Blue Reef Aquarium, which houses an "underwater safari" of aquatic life in Britain, and Cumberland House Natural History Museum, which features a variety of wildlife featured in the area. HMS Victory at Portsmouth Historic Dockyard is the world's oldest naval ship still in commission and is one of the city's most popular tourist attractions. Most of the city's landmarks and tourist attractions are related to its naval history. They include The D-Day Story in Southsea, which holds the 83 metres (272 ft)-long Overlord Embroidery. The city is home to some famous ships: in the dry dock of Portsmouth Historic Dockyard lies Horatio Nelson's flagship, HMS Victory, the world's oldest naval ship still in commission. HMS Victory was preserved for the nation and placed in permanent dry dock in 1922, when the Society for Nautical Research led a national appeal to restore her. 22 million people have visited her since. In 1971, the remains of Henry VIII's flagship, Mary Rose, was rediscovered on the seabed. She was raised and brought into a purpose-built structure in Portsmouth Historic Dockyard in 1982. Britain's first iron-hulled warship, HMS Warrior, was restored and moved to Portsmouth in June 1987 after serving as an oil fuel pier at Pembroke Dock in Pembrokeshire for fifty years. The National Museum of the Royal Navy is also in the historic dockyard, and is sponsored by an independent charity which aims to promote research into the history and archaeology of the Royal Dockyard. Every November the Historic Dockyard hosts the Victorian Festival of Christmas, which features Father Christmas in a traditional green-coloured robe. This memorial was erected by the people of Portsmouth in proud and loving memory of those who in the glorious morning of their days for England's sake lost all but England's praise. May light perpetual shine upon them. Portsmouth contains three cemeteries: Kingston, Milton Road, and Highland Road. Kingston Cemetery was opened in 1856 and lies on the eastern side of Fratton. At 52 acres (21 ha), it is the largest cemetery in the city and has about 400 burials a year. In February 2014, a ceremony was held at the cemetery to celebrate the 180th anniversary of Portsmouth's Polish community. Milton Road Cemetery, of some 25 acres (10 ha), was established on 8 April 1912 and has approximately 200 burials per year. There is also a crematorium at Portchester. A view of the Spinnaker Tower from the waterfront at Gunwharf Quays. The naval shore establishment, HMS Vernon, contained the Royal Navy's arsenal – weapons and ammunition would be taken from ships as they entered the harbour and would be resupplied as they headed out to sea. The 1919 Southsea and Portsmouth Official Guide described the establishment as "the finest collections of weapons outside the Tower of London, containing more than 25,000 rifles". In the early nineteenth century, Gunwharf Quays supplied the fleet with a "grand arsenal" consisting of cannons, mortars, bombs, and various ordinance. Gunpowder was not provided due to safety concerns; however, it could be obtained at Pridday's Hard near Gosport. An armoury existed to sell small arms to soldiers, along with blacksmith and carpenter shops for armourers. The establishment was run by three officers; a viz (storekeeper), a clerk, and a foreman. By 1817, Gunwharf purportedly housed the largest naval arsenal in the world, employing 5000 men at the time. HMS Vernon closed on 1 April 1996 and was redeveloped by Portsmouth City Council as Gunwharf Quays, a mixed residential and retail destination with outlet stores, restaurants, pubs, and cafés. Construction of the Spinnaker Tower began in 2001 and was completed in summer 2005. The project ran overbudget and cost £36 million, of which Portsmouth City Council contributed £11 million. The 560 feet (170 m) tower is visible from 23 miles (37 km) on a clear day, and its viewing platforms provide views across the Solent towards the Isle of Wight, and north towards the harbour and Southsea Castle. The tower has the largest glass floor in Europe and weighs more than 33,000 tonnes (32,000 long tons; 36,000 short tons). Southsea is a seaside resort and residential area that lies at the southern end of Portsea Island. The name Southsea originates from Southsea Castle, a castle on the seafront established in 1544 by Henry VIII to help defend the Solent and approaches to Portsmouth Harbour. The area was originally developed in 1809 as "Croxton Town", though by the 1860s the suburb of Southsea had expanded to provide houses for working-class people. During this time, Southsea grew as a seaside and bathing resort. A pump room and baths were erected near the present day Clarence Pier, and a large complex was developed including vapour baths, showers, and card playing and assembly rooms for holiday-goers. Clarence Pier was officially opened in 1861 by the Prince and Princess of Wales, and was named after the once military governor of Portsmouth, Lord Frederick FitzClarence. At the time of its opening, the pier was labelled as "one of the largest amusement parks on the south coast". South Parade Pier was built in 1878 and is among the 55 remaining private piers in the United Kingdom. The pier was originally used as a terminal for ferries travelling to the Isle of Wight, but it was soon redeveloped as a centre of entertainment. It had to be rebuilt after the first fire in 1904, and rebuilt again after the second fire in 1967. The third fire struck during filming of Tommy in 1974, after which it was rebuilt once again. In 2015, plans were unveiled to build the "Solent Eye" at the pier, an amusement ride with 24 gondolas resembling the London Eye, at a cost of £750,000. Southsea is dominated by Southsea Common, a grassland covering an area of 480 acres (190 ha), which was first created by draining the marshland alongside the construction of the vapour baths in 1820. The common owes its existence to the demands of the military in the early 19th century for a clear range of fire. The present day Common lies parallel to the shore from Clarence Pier to Southsea Castle. Today, the Common is a popular recreation ground, and also a venue for a number of annual events, which includes carnivals, Christmas markets, and Victorian festivals. The common also has a large collection of mature elm trees, believed to be the oldest and largest surviving in Hampshire, which have escaped Dutch elm disease owing to their isolation. Other plants include the Canary Island date palms Phoenix canariensis, which are some of the largest in Britain and have produced viable seed in recent years. St John the Evangelist is a Roman Catholic cathedral of worship, built in 1882. It is one of the two cathedrals of the city. Portsmouth has two cathedrals: the Anglican Cathedral of St Thomas in Old Portsmouth, and the Roman Catholic Cathedral of St John the Evangelist (the city is one of 34 British settlements with a Roman Catholic cathedral). The city's first chapel, dedicated to Thomas Becket, was built by Jean de Gisors in the second half of the 12th century. The chapel was rebuilt and developed into the parish church and then Anglican cathedral. It was damaged during the Siege of Portsmouth in 1642, but after the restoration of the monarchy the tower and nave were rebuilt. Significant changes were made when the Diocese of Portsmouth was established in 1927. It became a cathedral in 1932, and was enlarged, although construction was halted during the Second World War. The cathedral was re-consecrated in the presence of Queen Elizabeth The Queen Mother in 1991. The Royal Garrison Church was founded in 1212 by Peter des Roches, Bishop of Winchester. After centuries of decay, it became an ammunition store in 1540. The marriage of Charles II to Catherine of Braganza took place in the church in 1662. After the defeat of Napoleon at the Battle of Leipzig in 1814, large receptions were held inside the church. In 1941, a firebomb fell on the roof, destroying the nave. The church's chancel was saved by servicemen shortly after the raid; however, replacing the roof was determined to be impossible due to the large amounts of salt solution the stonework had absorbed over the years. Smaller places of worship in the city include St Jude's Church in Southsea, St Mary's Church in Portsea, St Ann's Chapel in the naval base and the Portsmouth and Southsea Synagogue, which is among the oldest synagogues in Britain. Fratton Park, home to Portsmouth F.C. Portsmouth F.C. play their home games at Fratton Park. They have won two Football League titles (1949 and 1950) and won the FA Cup in 1939 and 2008. They returned to the Premier League in 2003. In 2010 they were relegated to the Championship, and amid serious financial difficulties in February 2012, they were further relegated to League One. In 2013 Portsmouth were relegated again, this time placing them in the League Two, the fourth tier of English Football. In April 2013, Portsmouth F.C. was purchased by the Pompey Supporters Trust, becoming the largest fan-owned football club in English Football history. In May 2017, Portsmouth F.C. were promoted as League Two Champions to League One for the 2017-18 season. Moneyfields F.C. have been playing in the Wessex Football League Premier Division since 1998. United Services Portsmouth F.C. (formerly known as Portsmouth Royal Navy) and Baffins Milton Rovers F.C. both compete in Wessex League Division One, with United Services being formed in 1962, and Baffins Milton Rovers being founded in 2011. The rugby teams, United Services Portsmouth RFC and Royal Navy Rugby Union, both play their home matches at the United Services Recreation Ground in the city. Royal Navy Rugby Union play in the annual Army Navy Match at Twickenham. Portsmouth hosted first-class cricket at the United Services Recreation Ground from 1882, while from 1895 to 2000 Hampshire County Cricket Club matches were played there. This arrangement came to an end in 2000 when Hampshire moved all their home matches to their newly built Rose Bowl cricket ground in West End. The city is also home to four hockey clubs: City of Portsmouth Hockey Club, who are based at the University's Langstone Campus; Portsmouth & Southsea Hockey Club, and Portsmouth Sharks Hockey Club, who are both based at the Admiral Lord Nelson School; and United Services Portsmouth Hockey Club, who are based on Burnaby Road. Great Salterns Golf Club, established in 1926, is an 18-hole parkland course with two holes playing across Saltern lake. There are also coastal courses at Hayling, near the entrance to Langstone Harbour in the east and at the Gosport and Stokes Bay Golf Club to the west of Portsmouth Harbour entrance in Gosport. Boxing was a popular pastime, particularly between 1910 and 1960, with a monument being erected in 2017 to commemorate the city's boxing heritage. Portsmouth Harbour has passenger ferry links to Gosport and the Isle of Wight from the Portsmouth International Port, with a car ferry service to the Isle of Wight operated by Wightlink located nearby. Britain's longest-standing commercial hovercraft service, begun in the 1960s, still runs from near Clarence Pier to Ryde, Isle of Wight, operated by Hovertravel. Portsmouth Continental Ferry Port has links to Caen, Cherbourg-Octeville, St Malo, and Le Havre in France, Santander and Bilbao in Spain, and the Channel Islands. Ferry services from the port are operated by Brittany Ferries, Condor Ferries, and LD Lines. On 18 May 2006, Trasmediterranea started a service to Bilbao in competition with P&O's then-existing service. This service was criticised when the ferry Fortuny was detained in Portsmouth by the Maritime and Coastguard Agency for numerous safety breaches. The faults were quickly corrected by Trasmediterránea, and the service was cleared to begin carrying passengers on 23 May 2006. In March 2007, Trasmediterránea withdrew the Bilbao service at short notice, citing the need to deploy the Fortuny elsewhere. P&O Ferries ceased their service to Bilbao on 27 September 2010, due to "unsustainable losses". The port is the second-busiest ferry port in the UK after Dover, handling around three million passengers a year. Local bus services are provided by Stagecoach South East and First Hampshire & Dorset, serving the city of Portsmouth and its surrounding towns. Hovertravel and Stagecoach run a bus service called the Hoverbus from the city centre to Southsea Hovercraft Terminal and The Hard Interchange, near the seafront. In addition, Countryliner runs a Saturday service to Midhurst in West Sussex, and Xelabus operate a Sunday open-top seafront summer service around the city as of 2012. National Express services from Portsmouth run mainly from The Hard Interchange to London Victoria station, Cornwall, Bradford, Birkenhead and Bristol. The city has several mainline railway stations, including Portsmouth & Southsea and Portsmouth Harbour. Portsmouth lies on two different direct South Western Railway routes to London Waterloo via Guildford and Basingstoke. There is also a South Western Railway stopping service to Southampton Central and a service by Great Western Railway to Cardiff Central via Southampton, Salisbury, Bath and Bristol. Southern additionally offers service to Brighton, Gatwick Airport, Croydon, and London Victoria. Portsmouth Airport, an airport with a grass runway, was in operation from 1932 to 1973. After its closure, housing (Anchorage Park), industrial sites, retail stores (Ocean Retail Park), and a school (Admiral Lord Nelson School) were built on the site. Today, the nearest airport is Southampton Airport, situated in the Borough of Eastleigh, which lies 19.8 miles (31.9 km) away. The airport has an indirect South Western Railway rail connection requiring a change at Southampton Central or Eastleigh. Heathrow and Gatwick are 65 miles (105 km) and 75 miles (121 km) away, respectively. Gatwick is directly linked by Southern train services to London Victoria station, while Heathrow is linked by coach to Woking, which is on both rail lines to London Waterloo, or by London Underground. Heathrow is directly linked to Portsmouth by National Express coaches. There is an ongoing debate on the development of a new public transport structure, with monorails and light rail both being considered. A light rail link to Gosport was authorised in 2002 with completion expected in 2005, but it is unlikely that the project will be completed following the refusal of funding by the Department for Transport in November 2005. In April 2011, an article appeared in Portsmouth News suggesting a new scheme could be in the offing by running a light rapid transit system over the line to Southampton via Fareham, Bursledon, and Sholing, thus replacing the existing heavy rail services. Portsmouth, along with Southampton and its adjacent towns, are served predominantly with transmissions from the Rowridge Transmitter on the Isle of Wight, though the transmitter at Midhurst can provide a substitute for Rowridge. Portsmouth was one of the first cities in the UK to have a local TV station, MyTV; although the Isle of Wight had a local television service which began broadcasting in 1998. In November 2014, a new TV station, named That's Solent, was launched as part of a nationwide roll-out of local Freeview channels in south central England. The stations are broadcast from the Rowridge Transmitter on the Isle Of Wight. The local commercial radio station is The Breeze on 107.4FM, while the city also has a non-profit community radio station Express FM on 93.7FM. Patients at Portsmouth's primary hospital, Queen Alexandra in Milton, also have access to local programming from charity station Portsmouth Hospital Broadcasting, which starting broadcasting in 1951. When the first local commercial radio stations were licensed in the 1970s by the Independent Broadcasting Authority (IBA), Radio Victory was the radio service for Portsmouth. In 1986, due to transmission area changes by the IBA, it was replaced by a new company and service called Ocean Sound, later renamed as Heart Hampshire. From the city's 800th birthday in 1994, Victory FM broadcast for three 28-day periods over an 18-month period. It was purchased from the founders by TLRC, who, due to poor RAJAR figures, relaunched the service in 2001 as Ocean FM, with Portsmouth Football Club purchasing a stake in the station during 2007 and selling it in 2009. The city currently has one daily local newspaper known as The News. The paper was established in 1873 and was previously known as the Portsmouth Evening News. A free weekly newspaper is published by the same publisher, Johnston Press, called The Journal. The city has been home to a number of famed authors. Most notably Charles Dickens – known for such works as Oliver Twist, A Tale of Two Cities, and The Pickwick Papers – was born in Portsmouth. Arthur Conan Doyle, author of the Sherlock Holmes stories, practised as a doctor in the city and played in goal for Portsmouth Association Football Club, an amateur team not to be confused with the later professional Portsmouth Football Club. Rudyard Kipling, poet and author of the Jungle Book, and H. G. Wells, author of War of the Worlds and The Time Machine, lived in Portsmouth during the 1880s. Sir Walter Besant, a novelist and historian, was born in Portsmouth, writing one novel set exclusively in the town, By Celia's Arbour, A Tale of Portsmouth Town. Historian Frances Yates was born in Portsmouth and is known for her work on Renaissance esotericism. Sir Francis Austen, brother of Jane Austen, briefly lived in the area after graduating from Portsmouth Naval Academy. More contemporary Portsmouth literary figures include social critic, journalist, and author Christopher Hitchens, who was born in the city. Nevil Shute moved to Portsmouth in 1934 when he relocated his aircraft company to the city; his former home stands in Southsea. Fantasy author Neil Gaiman grew up in nearby Purbrook and the Portsmouth suburb of Southsea, and in 2013 had a Southsea road named after his novel The Ocean At The End Of The Lane. Olivia Manning's childhood was also spent in the city. Isambard Kingdom Brunel, a famed engineer of the Industrial Revolution, was born in Portsmouth. His father Marc Isambard Brunel worked for the Royal Navy and invented the world's first production line to mass manufacture pulley blocks for the rigging in Royal Navy vessels. James Callaghan, who was British prime minister from 1976 to 1979, was born and raised in Portsmouth. He was the son of a Protestant Northern Irish petty officer in the Royal Navy and was also the only person to have held all four Great Offices of State, having previously served as Foreign Secretary, Home Secretary, and Chancellor. John Pounds, the founder of the ragged school, which provided free education to working class children, lived in Portsmouth and set up the country's first ragged school in the city. Peter Sellers, comedian, actor, and performer, was born in Southsea, and Arnold Schwarzenegger lived and trained in Portsmouth for a short time. Several other professional actors have also been born, or lived, in the city, including; EastEnders actress Emma Barton, and Bollywood actress Geeta Basra, who originally hails from Portsmouth. Cryptozoologist Jonathan Downes was born and lived in Portsmouth for a time. Helen Duncan, the last person to be imprisoned under the 1735 Witchcraft Act in the UK, was arrested in Portsmouth. Also new ly joined to the Eastenders cast Lorraine Stanley was born and raised in Portsmouth. Notable sportspeople from Portsmouth include Michael East, a Commonwealth Games gold medal-winning athlete, Rob Hayles, cyclist and Olympic Games medal winner, Tony Oakey, former British light-heavyweight boxing champion, and Alan Pascoe, an Olympic medallist. Sir Alec Rose, single-handed yachtsman, Katy Sexton, former world champion swimmer who won gold in the 200 metres (660 ft) backstroke at the 2003 World Aquatics Championships in Barcelona, and Roger Black, an Olympic medallist, were also born in Portsmouth. ^ These were part of a network of fortifications intended to guard military bases on the British coastline from an inland attack. They were built in the 19th century under the orders of Lord Palmerston. ^ Portsmouth is one of 34 British towns and cities with a Catholic cathedral. ^ Vatican policy in England at the time was to found sees in locations other than those used for Anglican cathedrals. ^ "British urban pattern: population data" (PDF). ESPON project 1.4.3 Study on Urban Functions. European Union – European Spatial Planning Observation Network. March 2007. pp. 120–121. Archived from the original (PDF) on 24 September 2015. Retrieved 30 March 2015. ^ a b "Portsmouth Census Summary, Hampshire County Council" (PDF). Retrieved 29 March 2015. ^ "Ethnic Group by District" (PDF). Hampshire County Council. 2011. p. 38. Retrieved 3 October 2016. ^ a b c d Broom, Chris. "Concentrated Population Information". The News. Portsmouth City Council. Retrieved 29 March 2015. ^ a b "2011 Census – Built-up areas". Office for National Statistics. Retrieved 30 March 2015. ^ "UK Population Density". Neighbourhood Statistics. Retrieved 12 August 2016. ^ "Portsmouth is 'most densely populated' in England and Wales". The News. Portsmouth City Council. 20 January 2011. Retrieved 12 August 2016. ^ a b Hewitt 2013, p. 16. ^ Robert Amy. "Classic Britannica – the home of the Roman Fleet". Pompeymarkets. PM Ltd. Archived from the original on 17 April 2009. Retrieved 8 March 2011. ^ "Portsmouth name origin". Key to English Place-names. University of Nottingham. Retrieved 11 August 2016. ^ "Vortigern in the Sources: Anglo-Saxon Chronicle". VortigernStudies. Robert Vermaat. Retrieved 8 August 2016. ^ Winston Churchill (26 March 2015). A History of the English-Speaking Peoples Volume I: The Birth of Britain. Bloomsbury Publishing. p. 41. ^ "See Portsmouth through history". The Independent. 6 May 2014. Retrieved 8 August 2016. ^ Allen 2015, p. 26. ^ a b Allen 2015, p. 27. ^ Allen 2015, p. 29. ^ Allen 2015, p. 30. ^ Allen 2015, p. 31. ^ a b c d e f g h i j k l m "History of Portsmouth". Portsmouth Council. Archived from the original on 13 May 2010. Retrieved 12 March 2013. ^ a b c d e f g h i j k l m n o p q r s t u v "A History of Portsmouth". Local Histories. Retrieved 29 October 2015. ^ Allen 2015, p. 32. ^ a b Allen 2015, p. 33. ^ Quail 1994, p. 14–18. ^ Page, William (1908). "The liberty of Portsmouth and Portsea Island: Introduction". A History of the County of Hampshire: Volume 3. Victoria County History. Retrieved 25 February 2008. ^ Allen 2015, p. 34. ^ Allen 2015, p. 36. ^ Allen 2015, p. 37. ^ Allen 2015, p. 37, 39. ^ Allen 2015, p. 43. ^ a b Allen 2015, p. 44. ^ Sumption 1990, p. 395, 396. ^ "Portsmouth port history". World Post Source. Retrieved 19 July 2016. ^ Allen 2015, p. 48. ^ Allen 2015, p. 49. ^ a b Hewitt 2013, p. 27. ^ Hewitt 2013, p. 33. ^ Allen 2015, p. 53. ^ "Portsmouth's long shipbuilding history comes to an end". BBC. 6 November 2013. Retrieved 9 November 2013. ^ Allen 2015, p. 143. ^ Hewitt 2013, p. 23. ^ a b "''Portsmouth's Coat of Arms''". Portsmouth City Council. 29 May 2007. Archived from the original on 7 July 2011. Retrieved 7 November 2016. ^ "Southsea Castle History". Portsmouth Museums. 2015. ^ a b Hewitt 2013, p. 37. ^ Allen 2015, p. 54. ^ Allen 2015, p. 54, 55. ^ a b Allen 2015, p. 56. ^ Backhouse, Tim. "Old Portsmouth—Duke of Buckingham". Memorials and Monuments in Portsmouth. Archived from the original on 16 February 2008. Retrieved 28 August 2009. ^ a b "The Siege of Portsmouth". Portsmouth History. Retrieved 20 July 2016. ^ a b "The Siege of Portsmouth, August to September 1642". Little Woodham. Archived from the original on 3 June 2010. Retrieved 21 July 2016. ^ Allen 2015, p. 57. ^ a b "Royal Garrison Church, Portsmouth". English Heritage. Retrieved 3 August 2016. ^ Hewitt 2013, p. 57. ^ Allen 2015, p. 58. ^ Allen 2015, p. 65. ^ Collingridge 2003, p. 311. ^ "The First Fleet". Project Gutenberg. Retrieved 24 November 2013. ^ Frost 2012, p. 165. ^ Hewitt 2013, p. 223. ^ Hewitt 2013, p. 223, 224. ^ Hough 1972, p. 276. ^ Allen 2015, p. 130. ^ "Pompey, Chats and Guz: the Origins of Naval Town nicknames". Royal Naval Museum. 2000. Archived from the original on 8 August 2011. Retrieved 7 June 2011. ^ Hewitt 2013, p. 98. ^ Breverton 2010, p. 282. ^ Robert East H. Lewis, Extracts from Records in the Possession of the Municipal Corporation of the Borough of Portsmouth and from Other Documents Relating Thereto, 1891, p. 656. The claim connecting the coat of arms with the Great Seal of Richard I (which showed a star and a crescent, separately) dates to the 20th century, see Valentine Dyall, Unsolved Mysteries: A Collection of Weird Problems from the Past, 1954, p. 14). ^ a b "Portsmouth Royal Dockyard history: 1690–1840". Portsmouth Royal Dockyard. Retrieved 22 July 2016. ^ "Portsmouth Dockyard Block Mills history". Portsmouth Guide. Portsmouth Council. Retrieved 22 July 2016. ^ "Shipbuilding & The Dockyard". A Tale of One City. Portsmouth City Council. Retrieved 22 July 2016. ^ a b c Hewitt 2013, p. 39. ^ Pevsner 1967, p. 422. ^ a b Hewitt 2013, p. 79. ^ "From slave trade to humanitarian aid". BBC News. 19 March 2007. Retrieved 2 April 2007. ^ a b "A History of Portsmouth Water Supply". Welcome to Portsmouth. Portsmouth City Council. Retrieved 10 August 2016. ^ "John Pounds Memorial Church". InPortsmouth. CIS. Archived from the original on 10 April 2012. Retrieved 14 January 2015. ^ Hewitt 2013, p. 66, 67. ^ Rice 1999, p. 27–48. ^ "The Voyage of the Challenger". Stony Brook University. Retrieved 22 July 2016. ^ Hewitt 2013, p. 24. ^ a b Hewitt 2013, p. 91. ^ a b "Portsmouth Zeppelin air raid". Richthofen.com. Retrieved 8 March 2011. ^ "Portsmouth Dockyard, Hampshire: Mystery Zeppelin Attack". BBC. 30 July 2014. Retrieved 29 September 2016. ^ a b "Portsmouth's Coat of Arms history". Portsmouth City Council. Retrieved 23 July 2016. ^ a b c d "Guildhall History – Portsmouth Guildhall". www.portsmouthguildhall.org.uk. Portsmouth City Council. Retrieved 25 July 2016. ^ "Portsmouth Guildhall bombed during WWII". Portsmouthnowandthen.com. Archived from the original on 20 July 2012. Retrieved 8 March 2011. ^ "The Blitz, Portsmouth". Welcometoportsmouth.co.uk. Retrieved 10 August 2010. ^ Hewitt 2013, p. 151. ^ Hewitt 2013, p. 186. ^ Hewitt 2013, p. 147. ^ a b Hewitt 2013, p. 146. ^ Hewitt 2013, p. 155, 156. ^ O'Connor, Jerome. "Southwick House". Historyarticles.com. Archived from the original on 27 April 2006. Retrieved 8 March 2011. ^ a b Hewitt 2013, p. 160. ^ a b "Leigh Park history". Localhistories.org. Retrieved 8 March 2011. ^ Hind, Bob (3 January 2013). "Last bomb of the war found in Guildhall Walk". Portsmouth City Council. Retrieved 25 July 2016. ^ Hewitt 2013, p. 161. ^ Hewitt 2013, p. 92. ^ Hewitt 2013, p. 93. ^ Brendon 2007, p. 660. ^ "Duke of Edinburgh slams move to decommission the Royal Yacht Britannia". Mirror Online. Daily Mirror. 15 May 2011. Retrieved 20 July 2016. ^ "Learn About The Decommissioning Of The Royal Yacht Britannia". The Royal Yacht Britannia Trust. Retrieved 11 August 2016. ^ Alderson, Andrew (20 April 2003). "Queen blamed Major for royal yacht fiasco". The Telegraph. Retrieved 11 August 2016. ^ "Construction of the Spinnaker Tower". Mcdoa.org.uk. Retrieved 8 March 2011. ^ "R.I.P. Britain's Ugliest Building". BBC News. BBC. 24 March 2004. Retrieved 26 July 2016. ^ Hewitt 2013, p. 164. ^ "HMNB Portsmouth". Royal Navy. Retrieved 1 April 2015. ^ a b c d e f g h Google (1 October 2016). "Portsmouth" (Map). Google Maps. Google. Retrieved 1 October 2016. ^ Hewitt 2013, p. 14, 16. ^ a b Vine 1990. ^ "Ports Bridge, Portsmouth information". Old Hampshire Gazetteer. Retrieved 25 July 2016. ^ a b c "Landscape Character Assessment – Portsea Island Coastal Defence Flood Risk Areas" (PDF). Portsmouth City Council. Retrieved 12 August 2016. ^ "Rising Sea Levels: Case Study – Portsmouth (see page 13)" (PDF). Building Futures. Retrieved 1 April 2015. ^ "Spice island gates". Portsmouth City Council. Retrieved 8 March 2011. ^ "Farlington Marshes Wildlife Reserve". Visit Portsmouth. Portsmouth City Council. Retrieved 1 October 2016. ^ a b Patterson 1985. ^ a b c d "A History of Southsea". Local History. Retrieved 25 July 2016. ^ "History of Eastney". A Vision of Britain Through Time. University of Portsmouth. Retrieved 25 July 2016. ^ Webb 1989, p. 11. ^ Long 2007, p. 188. ^ Hewitt 2013, p. 80. ^ Hewitt 2013, p. 79, 80. ^ West, Ian. "Solent Geology". University of Southampton. Retrieved 1 April 2015. ^ "Electoral areas in Portsmouth". Portsmouth City Council. Retrieved 25 July 2016. ^ "A History of North End". Local Histories. Retrieved 25 July 2016. ^ "A History of Fratton". Local Histories. Retrieved 25 July 2016. ^ "History In Portsmouth: Southsea Railway Line". History in Portsmouth. University of Portsmouth. Retrieved 25 July 2016. ^ "Getting Here – Portsmouth Guildhall". Portsmouth Guildhall. Portsmouth City Council. Archived from the original on 9 April 2016. Retrieved 12 August 2016. ^ "Portsmouth's Guildhall Walk among 'violent' streets". BBC News. BBC. 1 February 2011. Retrieved 25 July 2016. ^ a b "Victoria Park history". Welcome to Portsmouth. Portsmouth City Council. Retrieved 25 July 2016. ^ a b "Portsmouth record temperatures". Metoffice.gov.uk. 19 November 2008. Retrieved 8 March 2011. ^ "GCSE Bitesize: UK climate". BBC Bitesize. BBC. Retrieved 12 August 2016. ^ a b "Portsmouth Climate, Met Office". Retrieved 1 April 2015. ^ "Portsmouth 1981–2010 averages". Station, District and regional averages 1981–2010. Met Office. Retrieved 4 November 2012. ^ "Southsea Weather Station". BADC. October 2013. Retrieved 25 October 2013. ^ "Portsmouth Sea Temperature". World Sea Temperature. Retrieved 26 July 2016. ^ Dickinson 1998, p. 390. ^ "Population Of Portsmouth In 2016". UK Population 2016. Retrieved 11 August 2016. ^ "A demographic profile of Portsmouth Past, Hampshire County Council" (PDF). Retrieved 29 March 2015. ^ "United Kingdom: Urban Areas in England - Population Statistics in Maps and Charts". City Population. Office for National Statistics. Retrieved 3 October 2016. ^ "2001 Census: Ethnic Group". Hampshire County Council. Retrieved 26 July 2016. ^ a b "Portsmouth Census and Ethnicity Information". Hampshire County Council. Retrieved 29 March 2015. ^ "A Review of A Glorious 25 years" (PDF). Portsmouth Chinese Association. Portsmouth City Council. Retrieved 26 July 2016. ^ Daly 2011, p. 27. ^ a b "Non-Anglican cathedrals". English Cathedrals. Retrieved 12 August 2016. ^ "List of Catholic Cathedrals in the UK". Love My Town. Retrieved 19 July 2009. ^ UK Census (2011). "Local Area Report – Portsmouth Local Authority (1946157284)". Nomis. Office for National Statistics. Retrieved 10 March 2018. ^ "Portsmouth first charter". Portsmouth City Council. Archived from the original on 14 October 2009. Retrieved 8 March 2011. ^ "The Portsmouth Plan" (PDF). Portsmouth City Council. 24 January 2012. Retrieved 13 August 2016. ^ "Local Government Review in England" (PDF). Parliament UK. 5 July 1995. Retrieved 26 July 2016. ^ Hewitt 2013, p. 18. ^ "Electoral areas in Portsmouth". Portsmouth City Council. Retrieved 29 March 2015. ^ a b "Your Councillors by Ward". Portsmouth Democracy. Portsmouth City Council. Retrieved 17 August 2018. ^ "Election Timetable in England" (PDF). Gov UK. Retrieved 14 August 2016. ^ "The Lord Mayor of Portsmouth". Portsmouth City Council. Retrieved 29 March 2015. ^ "Portsmouth Civic Offices contact directory". Portsmouth City Council. Retrieved 27 July 2016. ^ "Fundraising and Campaigning" (PDF). Portsmouth Cultural Trust. Retrieved 14 August 2016. ^ "Portsmouth Guildhall History". Portsmouth Guildhall. Portsmouth City Council. Retrieved 29 March 2015. ^ "Minister for Portsmouth to be Michael Fallon". BBC News. BBC. 16 January 2014. Retrieved 28 July 2016. ^ "Queen Elizabeth Class Aircraft Carrier Project Information". Ministry of Defence. Archived from the original on 23 November 2009. Retrieved 24 October 2009. ^ "MoD confirms £3.8bn carrier order". BBC News. 25 July 2007. Retrieved 24 September 2009. ^ a b Tovey, Andy (24 May 2016). "Inside Britain's biggest-ever aircraft carrier HMS Queen Elizabeth". The Telegraph. Retrieved 28 July 2016. ^ "History and Heritage". Portsmouth International Port. Retrieved 14 August 2016. ^ "Camber Dock and fishing fleet". Portsmouth International Port. Retrieved 29 July 2016. ^ "IBM declares that Portsmouth is still its HQ despite job cuts". The News. Portsmouth City Council. 7 April 2014. Retrieved 14 August 2016. ^ "Portsmouth Shopping". Virtual Tourist. Retrieved 29 July 2016. ^ "Cascades – Find Us". Cascades Shopping. Retrieved 12 August 2016. ^ "Cascades Portsmouth – Shopping Centre in Commercial Road Portsmouth". Welcome to Portsmouth. Portsmouth City Council. Retrieved 15 August 2016. ^ a b "Gunwharf Quays history". A Tale of One City. Portsmouth City Council. Retrieved 25 July 2016. ^ "Salford Quays milestones: the story of Salford Quays" (PDF). Salford.gov.uk. Archived from the original (PDF) on 4 April 2008. Retrieved 12 April 2008. ^ "Victorian Festival of Christmas 2016". Portsmouth Historic Dockyard. Archived from the original on 25 February 2016. Retrieved 15 August 2016. ^ "Things To Do in Portsmouth". Gunwharf Quays. Portsmouth City Council. Retrieved 29 July 2016. ^ "Ocean Retail Park in Portsmouth". Welcome to Portsmouth. Portsmouth City Council. Retrieved 15 August 2016. ^ "No 1 Gunwharf Quays, Portsmouth information". British Home Awards. Archived from the original on 19 August 2016. Retrieved 6 August 2016. ^ "Property Full Details – No 1 Gunwharf Quays". Waterside Properties. 5 April 2012. Retrieved 6 August 2016. ^ "Admiralty Quarter, Portsmouth". Find A New Home. The Digital Property Group Limited. Archived from the original on 23 April 2009. Retrieved 7 May 2009. ^ French, Claire (14 August 2014). "Five-star hotel developer considers Portsmouth sites". Portsmouth City Council. Retrieved 6 August 2016. ^ "Hotel bid ready to reach for the skies". Portsmouth City Council. Retrieved 9 August 2011. ^ Nimmo, Joe (31 July 2012). "Hunt for company to build the Blade tower continues". Portsmouth City Council. Retrieved 6 August 2016. ^ "Portsmouth unveil new stadium plans". The Guardian. 25 April 2007. Retrieved 6 August 2016. ^ "Design: Portsmouth Dockland Stadium – StadiumDB.com". Stadium DB. Retrieved 6 August 2016. ^ "Pie-in-the-sky or a real winner for our city?". Portsmouth City Council. Archived from the original on 13 October 2007. ^ "Majority say it's a threat to harbour". Portsmouth City Council. Archived from the original on 13 October 2007. ^ "The best football stadiums that were never built". The Mirror. 4 November 2015. Retrieved 2 September 2016. ^ Brown, Lisa (19 May 2016). "Enemies will 'think twice' about war with Britain when carrier is done". Daily Mail. Retrieved 6 August 2016. ^ "MOD confirms carrier order". BBC News. BBC. Retrieved 11 December 2008. ^ "Cammell Laird wins £50m Royal Navy warship contract". Liverpool Echo. 25 January 2010. Retrieved 5 August 2016. ^ "New carriers being built at Portsmouth base". Ministry of Defence. Archived from the original on 9 November 2016. Retrieved 6 August 2016. ^ "BAE Systems ends shipbuilding in Portsmouth". BBC News. BBC. 18 August 2014. Retrieved 6 August 2016. ^ Stretch, Euan (27 August 2014). "Centuries of Portsmouth shipbuilding ends as last ship leaves Royal Navy's oldest dockyard". The Mirror. Retrieved 6 August 2016. ^ Assinder, Nick (6 November 2013). "Political Row as Portsmouth Shipyard 'Sacrificed' in Scottish Independence Campaign". International Business Times. Retrieved 6 August 2016. ^ "Visions and Values". New Theatre Royal. Portsmouth City Council. Retrieved 29 July 2016. ^ "Kings Theatre – What's On". London Theatre Direct. Retrieved 16 August 2016. ^ "History of Groundlings Theatre". Groundlings Theatre. Retrieved 29 July 2016. ^ "List of theatres designed by Frank Matcham". Frank Matcham society. Retrieved 29 July 2016. ^ "Portsmouth Guildhall Music Events". Portsmouth Guildhall. Portsmouth City Council. Archived from the original on 30 July 2016. Retrieved 30 July 2016. ^ "Wedgewood Rooms music venues". Wedgewood Rooms CIC. Retrieved 30 July 2016. ^ "Pyramids Centre list of music events". Pyramids Live. Retrieved 30 July 2016. ^ "Portsmouth Guildhall announce increased capacity – Portsmouth Guildhall". Portsmouth Guildhall. Portsmouth City Council. Retrieved 16 August 2016. ^ "Queen hears chimes on D-Day visit". BBC News. BBC. 30 April 2009. Retrieved 30 July 2016. ^ "Events – Bournemouth Symphony Orchestra at the Guildhall". Bournemouth Symphony Orchestra. Arts Council England. Retrieved 30 July 2016. ^ "The Real Godfathers of Punk". Portsmouth Sinfonia. Times Newspapers Ltd. 30 May 2004. Retrieved 30 July 2016. ^ "Who were the Portsmouth Sinfonia?". Classical Music Reimagined. 15 March 2016. Retrieved 30 July 2016. ^ "The Portsmouth Summer Show 2016". Efestivals. Retrieved 1 October 2016. ^ "William Walton – general information". Walton Trust. Retrieved 30 July 2016. ^ Pirie, Peter J. (April 1964). "Scapino. The Development of William Walton". The Musical Times. The Musical Times, Vol. 105, No. 1454. 105 (1454): 258–259. doi:10.2307/949354. JSTOR 949354. ^ "Walton: Portsmouth Point Overture on CD & download (MP3 & FLAC) – Buy online from Presto Classical". Presto Classical Limited. Retrieved 30 July 2016. ^ Stedman 1996, p. 157–158. ^ "Pineapple Poll". Southern Youth Ballet. Retrieved 30 July 2016. ^ "The Royal Ballet in Pineapple Poll". BBC. Retrieved 30 July 2016. ^ "The pride and tears of D-Day". Portsmouth City Council. 12 October 2006. Archived from the original on 27 September 2007. Retrieved 8 June 2007. ^ "D-Day 70th anniversary: Ceremonies and staged landing held". BBC News. BBC. 5 June 2004. Retrieved 30 July 2016. ^ Vaidyanathan, Rajini (20 February 2011). "Barack Obama's UK visit: Where did past presidents go?". BBC News. BBC. Retrieved 8 March 2011. ^ "D-Day 50 Commemorations". Portsmouth Guide. Portsmouth City Council. Retrieved 30 July 2016. ^ "About the Kite Festival". Portsmouthkitefestival.org.uk. Retrieved 1 October 2016. ^ Adams, Matthew (20 November 2013). "Pompey by Jonathan Meades: Book review – a startlingly filthy read". The Independent. Retrieved 30 July 2016. ^ Cooke, Rachel (10 November 2013). "Jonathan Meades: 'I find everything fascinating and that is a gift'". The Guardian. Retrieved 30 July 2016. ^ Wiltshire, John. "Exploring Mansfield Park in the footsteps of Fanny Price" (PDF). jasna. Retrieved 19 August 2016. ^ "Dickens' novel influences on Portsmouth". Portsmouth City Council. 22 July 1904. Retrieved 8 March 2011. ^ "Jack Aubrey's England tour" (PDF). Brian Lavery. Archived from the original (PDF) on 17 August 2016. Retrieved 30 July 2016. ^ The Literary World, Volume 17. 1878. p. 120. Retrieved 30 July 2016. ^ Cummins, Anthony. "Kipps by HG Wells – review". The Guardian. Retrieved 30 July 2016. ^ Flood, Alison (21 June 2013). "Neil Gaiman novel inspires Portsmouth street name". The Guardian. Retrieved 30 July 2016. ^ "'Hanging Out with the Dream King': An Interview with Neil Gaiman". Star & Crescent. 16 February 2015. Retrieved 19 August 2016. ^ "Other novels in Portsmouth culture". Graham Hurley Publishing. Retrieved 8 March 2011. ^ "Heartsone, by C. J Sansom". The Independent. Retrieved 29 July 2016. ^ "Portsmouth Fairy Tales for Grown-Ups". Love Southsea. Portsmouth City Council. Archived from the original on 20 August 2016. Retrieved 30 July 2016. ^ "Portsmouth Fairy Tales for Grown Ups information". William Sutton. Retrieved 30 July 2016. ^ "William Sutton – A Shilling Shocker Short Story". Angry Robot Books. Retrieved 5 February 2016. ^ "Diana Bretherick, LBA Literary Agents". LBA Literary Agents. Retrieved 5 February 2016. ^ "University of Portsmouth information". The Complete University Guide. Retrieved 12 June 2015. ^ Josie Gurney-Read (29 April 2015). "Top 100 new universities - the list in full". Telegraph. Retrieved 8 November 2016. ^ "Portsmouth in Top 100 Modern Universities in world". UoP News. University of Portsmouth. 29 April 2015. Retrieved 8 November 2016. ^ Hewitt 2013, p. 198. ^ "Higher National Certificates at Higbury". Highbury College Portsmouth. Retrieved 31 July 2016. ^ "Access to Higher Education at Portsmouth College". Portsmouth College. Archived from the original on 23 March 2016. Retrieved 31 July 2016. ^ Timms, Dave. "Admiral Lord Nelson School Map". Welcome to Portsmouth. Portsmouth City Council. Retrieved 20 August 2016. ^ "Miltoncross Academy". UCAS Progress. Retrieved 20 August 2016. ^ Richardson, Hannah (5 July 2010). "School buildings scheme scrapped". BBC News. BBC. Retrieved 8 March 2011. ^ "Satisfactory is not good enough for city's schools". Portsmouth City Council. 10 November 2009. Retrieved 31 July 2016. ^ Garner, Richard (5 January 2014). "'The children used to throw chairs at people out of the window'". The Guardian. Retrieved 31 July 2016. ^ "Charter school in different class". BBC News. BBC. 24 August 2010. Retrieved 31 July 2016. ^ "Admissions policy". Charter Academy. Retrieved 31 July 2016. ^ "Portsmouth Grammar School". Principal Corporation Ltd. Retrieved 19 August 2016. ^ a b Hewitt 2013, p. 200. ^ "The Top 100 Prep Schools by Key Stage 2 Tests". Best-schools.co.uk. Education Advisers Ltd. Archived from the original on 14 January 2007. Retrieved 9 August 2011. ^ "A-level results 2013: Independent schools results table". The Telegraph. 24 August 2013. Retrieved 31 July 2016. ^ "Mayville High School homepage". Mayville High School. Retrieved 31 July 2016. ^ "St John's College – A Christian Day & Boarding School". St John's College. Retrieved 31 July 2016. ^ Hewitt 2013, p. 201. ^ "Purbrook Fort" (PDF). Victorian Forts. Hampshire County Council. Retrieved 3 August 2016. ^ "Fort Nelson Royal Armouries". Royal Armouries. Retrieved 3 August 2016. ^ "About Southsea Castle". Southsea Castle. Portsmouth City Council. Retrieved 3 August 2016. ^ "Royal Marines Museum Account 2010–2011" (PDF). Gov UK. Retrieved 22 August 2016. ^ "Royal Marines Museum relocates following £14m grant". BBC News. BBC. 19 May 2016. Retrieved 3 August 2016. ^ "The Charles Dickens Birthplace Museum". Charles Dickens Birthplace. Portsmouth City of Museums. Retrieved 3 August 2016. ^ Hewitt 2013, p. 73. ^ "Charles Dickens Birthplace Museum, Portsmouth". British Listed Buildings. Retrieved 1 October 2016. ^ "Blue Reef Aquarium". Visit Portsmouth. Portsmouth City Council. Retrieved 3 August 2016. ^ "Cumberland House Natural History Museum". Portsmouth Natural History. Portsmouth City Council. Retrieved 3 August 2016. ^ "Cumberland House Natural History Museum". Visit Portsmouth. Portsmouth City Council. Retrieved 3 August 2016. ^ "D-Day Museum and Overlord Embroidery". D-Day Museum. Portsmouth City Council. Retrieved 2 August 2016. ^ Hewitt 2013, p. 156. ^ "History of HMS Victory". HMS Victory. The National Museum. Retrieved 2 August 2016. ^ "Raising the Mary Rose – The Mary Rose Museum". Mary Rose Museum. Portsmouth City Council. Archived from the original on 30 July 2016. Retrieved 25 July 2016. ^ Hewitt 2013, p. 42. ^ "Restoration — Homecoming". HMS Warrior Preservation Trust. Retrieved 28 March 2013. ^ Winton 1987, p. 5. ^ "History of the Trust". Portsmouth Royal Dockyard Historical Trust. Retrieved 2 August 2016. ^ "Victorian Festival of Christmas". Mary Rose. Hampshire County Council. Archived from the original on 14 August 2016. Retrieved 2 August 2016. ^ "Victorian Festival of Christmas". Historic Dockyard. Portsmouth City Council. Archived from the original on 21 July 2016. Retrieved 2 August 2016. ^ "Projects – Royal Marines Museum". Royal Marines Museum. The National Museum. ^ Hewitt 2013, p. 135. ^ "Portsmouth Naval Memorial Cemetery Details". Commonwealth War Graves Commission. Retrieved 22 August 2016. ^ "The Guildhall Square Cenotaph". Imperial War Museums. Retrieved 3 August 2016. ^ "Memorials and Monuments in Portsmouth City Centre (The Guildhall Square Cenotaph)". Memorials in Portsmouth. Portsmouth City Council. Retrieved 3 August 2016. ^ a b "Portsmouth cemeteries". Portsmouth City Council. Archived from the original on 2 October 2016. Retrieved 1 October 2016. ^ "Portsmouth's Polish community marks 180th anniversary". BBC. 23 February 2014. Retrieved 1 October 2016. ^ Hewitt 2013, p. 185, 186. ^ Allen 2015, p. 123. ^ Allen 2015, p. 123, 124. ^ "History of HMS Vernon". Mcdoa. Retrieved 3 August 2016. ^ "Shops at Gunwharf Quays". Gunwharf Quays. Portsmouth City Council. Retrieved 3 August 2016. ^ "Spinnaker opens five years late". BBC News. BBC. 18 October 2005. Retrieved 3 August 2016. ^ "Spinnaker Tower, Portsmouth". Skyscraper News. Retrieved 3 August 2016. ^ Hewitt 2013, p. 232. ^ "History & Construction – Spinnaker Tower". Spinnaker Tower. Portsmouth City Council. Retrieved 22 August 2016. ^ a b Hewitt 2013, p. 233. ^ "Spinnaker Tower overview". The World Federation of Great Towers. Retrieved 3 August 2016. ^ "About Southsea Castle'". Portsmouth Museums. 2015. ^ Quail 2000, p. 16–17. ^ Hewitt 2013, p. 140. ^ a b Hewitt 2013, p. 138. ^ Quail 2000, p. 46. ^ "Plan unveiled for £750,000 ferris wheel similar to London Eye on Southsea seafront". The News. Retrieved 1 October 2016. ^ a b Quail 2000, p. 19–20. ^ "Top Events for 2016 at Southsea Common". Visit Portsmouth. Portsmouth City Council. Retrieved 3 August 2016. ^ Hewitt 2013, p. 136. ^ "Southsea Common Trees". Portsmouth City Council. Retrieved 29 March 2015. ^ "List of UK Cathedrals". Historic UK. Retrieved 29 March 2015. ^ "St Thomas's Portsmouth Cathedral | Old Portsmouth". Welcometoportsmouth.co.uk. Retrieved 9 August 2011. ^ a b "History of Portsmouth Cathedral". Portsmouth Cathedral. Portsmouth City Council. Archived from the original on 20 January 2015. Retrieved 3 August 2016. ^ "Portsmouth chapel history". History.inportsmouth.co.uk. 10 January 1941. Archived from the original on 11 July 2010. Retrieved 8 March 2011. ^ Knowles 2006, p. 21. ^ Hewitt 2013, p. 44. ^ "Portsmouth Cathedral, History and Visiting". Hampshire Guide. Britain Express. Retrieved 3 August 2016. ^ Hewitt 2013, p. 150. ^ a b "History of St John's Catholic Cathedral". St John's Catholic Cathedral. Retrieved 3 August 2016. ^ "Diocese of Portsmouth, Catholic Encyclopedia". Newadvent. Retrieved 8 March 2011. ^ "St Jude's Church Southsea". Diocese of Portsmouth. Retrieved 29 September 2016. ^ "Saint Mary's Church". Visit Portsmouth. Portsmouth City Council. Retrieved 29 September 2016. ^ "Church of Saint Ann (Building Number 1/65)". British Listed Buildings. Retrieved 29 September 2016. ^ "The Portsmouth and Southsea Hebrew Congregation". Jack White. Retrieved 29 September 2016. ^ "Pompey FC Results – Season 1948 to 1949". Portsmouth Arena. Archived from the original on 11 August 2009. Retrieved 31 July 2016. ^ "English Football League 1949–50". Rec Sport Soccer Statistics Foundation. Retrieved 24 February 2010. ^ Neasom 1984, p. 21. ^ "Portsmouth 1–0 Cardiff". BBC News. 17 May 2008. Archived from the original on 17 January 2010. Retrieved 22 April 2010. ^ "Portsmouth clinch promotion and championship". RTÉ Sport. 27 April 2003. Archived from the original on 10 August 2011. Retrieved 27 August 2007. ^ "Portsmouth FC winding up would be 'utter disaster'". BBC News. BBC. 6 February 2012. Retrieved 3 September 2016. ^ a b Moxley, Neil (17 April 2013). "FA Cup winners to League Two in just five years ... Pompey's shocking fall from grace". Daily Mail. Retrieved 31 July 2016. ^ Gibson, Owen (10 April 2013). "Portsmouth fans celebrate 'historic day' as deal done for Fratton Park". The Guardian. Retrieved 31 July 2016. ^ Simon, Mundie (2 August 2013). "Portsmouth FC begin new era as football league starts". Newsbeat. BBC. Retrieved 3 September 2016. ^ "Moneyfields FC overview and statistics". Football Club History Database. Retrieved 31 July 2016. ^ "United Services Portsmouth history". United Services Portsmouth. Archived from the original on 18 August 2007. Retrieved 31 July 2016. ^ "Baffins Milton Rovers FC overview". Sydenham. Wessex League. Retrieved 31 July 2016. ^ "Fixtures: Royal Navy Rugby Union". Navy Rugby Union. Retrieved 18 March 2015. ^ "United Services Recreation Ground info". Cricinfo. ESPN. Retrieved 2 September 2016. ^ Allen, Dave (20 July 2000). "United Services Portsmouth – The Hampshire Years 1888–2000". ESPNcricinfo. Retrieved 29 December 2011. ^ "Information – City of Portsmouth Hockey Club". Pitch Hero. Retrieved 31 July 2016. ^ "Portsmouth and Southsea Hockey Club". Cylex. Retrieved 31 July 2016. ^ "United Services Hockey Club contact information". Pitcher. Retrieved 23 August 2016. ^ Records of the Corporation. Published under Official Authority by Charpentier. 1966. p. 71. ^ "Great Salterns Golf Course/Portsmouth Golf Centre". Golf Today. Retrieved 1 October 2016. ^ "Memorial commemorates Portsmouth boxing greats". ^ "Portsmouth Ferry. Buy Portsmouth Ferry Tickets. Portsmouth Ferries". AFerry. Retrieved 27 February 2013. ^ "Wightlink Ferries". Wightonline. Archived from the original on 28 May 2013. Retrieved 9 August 2011. ^ "Hovercraft and Hoverbus Timetable". Hovertravel. Retrieved 9 August 2011. ^ "Portsmouth to Caen ferries". Brittany Ferries. Retrieved 9 August 2011. ^ "Continental Ferryport". Portsmouth to France. InterCash Bureau de Change Ltd. Archived from the original on 10 March 2012. Retrieved 9 August 2011. ^ a b "Portsmouth to Spain ferries". Brittany Ferries. Retrieved 4 August 2016. ^ "Portsmouth Ferry to Channel Islands". Channel Island Ferries. Retrieved 4 August 2016. ^ "Condor Ferries Portsmouth Terminal: Portsmouth ferry terminal, port directions, and facilities". Condor Ferries. Retrieved 4 August 2016. ^ "LD Lines Ferries main page". LD Lines. Retrieved 4 August 2016. ^ "Ferry impounded over safety fears". BBC News. BBC. 18 May 2006. Retrieved 4 August 2016. ^ "Ferry cleared to begin crossings". BBC News. BBC. 23 May 2006. Retrieved 4 August 2016. ^ "AT Ferries Portsmouth Bilbao service ends – 2007". Direct Ferries. 8 March 2007. Retrieved 4 August 2016. ^ "Final P&O Pride of Bilbao service docks in Portsmouth". BBC News. BBC. 28 September 2010. Retrieved 4 August 2016. ^ "Pride of Bilbao's Portsmouth era". BBC News. BBC. 1 October 2010. Retrieved 4 August 2016. ^ "UK Port Freight Statistics 2014" (PDF). Gov UK. Retrieved 4 August 2016. ^ Wright, Robert (22 November 2009). "Portsmouth in line for port revamp". Financial Times. Retrieved 4 August 2016. ^ "Previously announced changes to bus services". West Sussex County Council. Archived from the original on 11 October 2016. Retrieved 3 August 2016. ^ Nimmo, Joe (29 March 2012). "Open-top buses will return to Southsea seafront to boost tourism". Portsmouth City Council. Retrieved 3 August 2016. ^ "Portsmouth Coach Services". Welcome To Portsmouth. Portsmouth City Council. Retrieved 3 August 2016. ^ "National Rail Enquiries –Station facilities for Portsmouth & Southsea". National Rail. Retrieved 29 September 2016. ^ "Station facilities for Portsmouth Harbour". National Rail. Retrieved 29 September 2016. ^ "National Rail Enquiries – Station facilities for Portsmouth". National Rail. Retrieved 3 August 2016. ^ "Portsmouth – South West Trains". South West Trains. Archived from the original on 18 August 2016. Retrieved 3 August 2016. ^ "Trains to Portsmouth: Southern". Southern Railway. Retrieved 3 August 2016. ^ Fagan, Dave. "History of Portsmouth Airport". Hampshire Airfields. Retrieved 4 August 2016. ^ "Portsmouth Airport History". Portsmouth Airport. Archived from the original on 21 June 2015. Retrieved 4 August 2016. ^ Rail Saver. "South West Trains". Railsaver.co.uk. Archived from the original on 3 August 2011. Retrieved 9 August 2011. ^ "Trains Gatwick Airport to Portsmouth Harbour – Train Timetables". Train Line. National Rail. Retrieved 4 August 2016. ^ "203 Route, Southsea to Heathrow Airport – National Express". Coachtracker. National Express. Retrieved 4 August 2016. ^ "Hampshire County Council with Portsmouth City Council". Railway Technology. Kable. Retrieved 3 August 2016. ^ "Local Transport Plan 3" (PDF). Hampshire County Council. Retrieved 3 August 2016. ^ Hampshire County Council (29 November 2005). "Promoter Slams Government For Tram Scheme". Archived from the original on 12 January 2007. Retrieved 8 April 2007. ^ Pawley, Edward (1972). BBC engineering, 1922–1972. London: British Broadcasting Corporation. ISBN 0-563-12127-0. ^ "Putting Portsmouth in the Picture". TV Ark. Archived from the original on 11 August 2016. Retrieved 30 July 2016. ^ "That's Solent launches new local TV service for Southampton and Portsmouth area". a516digital. 26 November 2014. Retrieved 2 September 2016. ^ "Predicted That's Solent Coverage". Recombu. Retrieved 4 August 2013. ^ "The Breeze Portsmouth". The Breeze. Celador Radio Limited. Retrieved 30 July 2016. ^ "About Us – Express FM". Express FM. Express FM and Aiir. Archived from the original on 29 July 2016. Retrieved 30 July 2016. ^ "QA Radio". Hospital Broadcasting Association. Retrieved 23 August 2016. ^ "Could Portsmouth's Radio Victory make a comeback?". Portsmouth City Council. 11 March 2016. Retrieved 30 July 2016. ^ "Celador wins back the Portsmouth licence". Radio Today. 23 April 2015. Retrieved 30 July 2016. ^ "Southampton's Radio Hampshire ceases broadcasting". Archived from the original on 30 May 2009. Retrieved 28 May 2009. ^ "About us – Portsmouth News". Portsmouth News. Portsmouth City Council. Archived from the original on 13 August 2016. Retrieved 30 July 2016. ^ "Portsmouth daily newspapers". WRX ZEN. Retrieved 8 March 2011. ^ "Charles Dickens Birthplace". Charles Dickens Birthplace. Retrieved 9 August 2011. ^ "Arthur Conan Doyle: 19 things you didn't know". The Daily Telegraph. Retrieved 6 August 2016. ^ "Blue plaques". Portsmouth City Council. Retrieved 6 August 2016. ^ "Discovering city's rich literary heritage". Portsmouth City Council. Retrieved 6 August 2016. ^ Owen, Chris (18 April 2016). "'When I was reading Besant's book, I repeatedly gasped'". Portsmouth City Council. Retrieved 6 August 2016. ^ "By Celia's Arbour". Life Is Amazing. Archived from the original on 21 August 2016. Retrieved 12 July 2013. ^ "Sir Francis William Austen: Glimpses of Jane's sailor brother in letters". Jane Austen's World. 8 October 2009. Retrieved 6 August 2016. ^ "Results for England & Wales Births 1837–2006". Find My Past. Retrieved 10 June 2015. ^ "Nevil Shute Norway Blue Plaques". Open Plaques. Retrieved 28 July 2014. ^ "Neil Gaiman novel inspires Portsmouth street name". The Guardian. ^ "The struggles of Olivia Manning". Newstatesman. Retrieved 6 August 2016. ^ "History – Isambard Kingdom Brunel". BBC History. BBC. Retrieved 6 August 2016. ^ "Isambard Kingdom Brunel". Brunel AC. Archived from the original on 18 April 2005. Retrieved 28 July 2014. ^ "James Callaghan biography". BBC History. BBC. Retrieved 27 July 2016. ^ Morgan, Kenneth (27 March 2012). "James Callaghan: a great PM who, 100 years on, still stands tall". The Guardian. Retrieved 27 July 2016. ^ "James Callaghan". Number 10. Gov UK. Archived from the original on 2 December 2010. Retrieved 9 August 2011. ^ "Great Educator: John Pounds 1766 to 1839". Ragged University. 18 September 2014. Retrieved 6 August 2016. ^ Milligan, Spike (2004). "Sellers, Peter (1925–1980)". Oxford Dictionary of National Biography. Oxford University Press. doi:10.1093/ref:odnb/31669. Retrieved 9 July 2012. ^ "An Austrian hick in London: Arnie's early years". Telegraph. Retrieved 6 August 2016. ^ "Emma Barton: 'You have got to take risks with your choices'". The News. Portsmouth City Council. Retrieved 6 August 2016. ^ "Bollywood actress in Portsmouth". Indiazen. 11 July 2007. Archived from the original on 1 September 2012. Retrieved 8 March 2011. ^ "Cryptozoology – Jon Downes biography". CFZ. Retrieved 6 August 2016. ^ "The Official Helen Duncan Web Site". Helen Duncan. 6 December 1956. Archived from the original on 26 September 2009. Retrieved 9 August 2011. ^ "Athlete Profile – Michael East". The Power of 10. Retrieved 6 August 2016. ^ "About Rob Hayles". Rob Hayles. Retrieved 6 August 2016. ^ "Tony Oakey profile". BoxRec. Retrieved 6 August 2016. ^ "Track stalwart who did city so proud". The News. Portsmouth City Council. 1 June 2010. Retrieved 6 August 2016. ^ "1968: Alec Rose sails home". BBC News. BBC. 4 July 1968. Retrieved 6 August 2016. ^ "About – Katy Sexton Swim Academy". Katy Sexton. Archived from the original on 28 May 2016. Retrieved 6 August 2016. ^ "Biography of Roger Black – Former Olympic Silver Medalist". Roger Black. 31 March 1966. Retrieved 9 August 2011. Allen, Lake (2015). Wingett, Matt (ed.). The History of Portsmouth. Life Is Amazing. p. 216. ISBN 978-0-9572413-6-7. Breverton, Terry (2010). Breverton's Nautical Curiosities. 21 Bloomsbury Square, London: Quercus Publishing PLC. ISBN 978-1-84724-776-6. Churchill, Winston Spencer (1968). History of the English Speaking People: Birth of Britain, 55 B.C. to 1485. Dodd Mead. p. 65. ISBN 978-0-396-03841-2. Clark, Celia (2009). The Tricorn: The Life and Death of a Sixties Icon. Tricorn Books Ltd. ISBN 978-0-9562498-0-7. Collingridge, Vanessa (February 2003). Captain Cook: The Life, Death and Legacy of History's Greatest Explorer. Ebury Press. ISBN 0-09-188898-0. Daly, Gerry (2011). Crown, Empire and Home Rule: The Irish in Portsmouth c. 1880–1923. VDM Verlag Dr. Müller. ISBN 3-639-09018-7. Dickinson, Robert E. (1998). City and Region: A Geographical Interpretation. Taylor & Francis. ISBN 978-0-415-17697-2. Frost, Alan (2012). The First Fleet: The Real Story. Collingwood: Black Inc. ISBN 978-1-86395-561-4. Hewitt, Phil (2013). A Portsmouth Miscellany. Summersdale. p. 233. ISBN 1-84953-463-2. Hough, Richard (1972). Captain Bligh and Mr Christian: The Men and the Mutiny. London: Hutchinsons. ISBN 978-0-09-112860-9. Knowles, Graeme (2006). Portsmouth Cathedral. RJL Smith & Associates Much Wenlock. ISBN 1-872665-94-2. Long, Rod (1 January 2007). South Coast Saunter. Pegasus Elliot Mackenzie Pu. ISBN 978-1-84386-286-4. Neasom, Mike (1984). Pompey: The History of Portsmouth Football Club. Milestone Publications. ISBN 0-903852-50-0. Patterson, B.H. (1985). A Military Heritage A history of Portsmouth and Portsea Town Fortifications. Fort Cumberland & Portsmouth Militaria Society. Patterson, Alfred (1976). Portsmouth: A History. Moonraker Press. Pevsner, Nikolaus (1967). The Buildings of England Hampshire and the Isle of Wight. Penguin Books. ISBN 0-14-071032-9. Rice, A.L. (1999). "The Challenger Expedition". Understanding the Oceans: Marine Science in the Wake of HMS Challenger. Routledge. ISBN 978-1-85728-705-9. Mitchell, Garry (1988). Hilsea Lines and Portsbridge. Garry Mitchell. Quail, Sarah (1994). The Origins of Portsmouth and the First Charter. City of Portsmouth. ISBN 0-901559-92-X. Quail, Sarah (2000). Southsea Past. Philimore Publishing. ISBN 1-86077-145-9. Seward, Desmond (1988). A Brief History of the Hundred Years War: The English in France, 1337–1453. Little, Brown Book Group. ISBN 978-1-4721-1220-0. Stedman, Jane W. (1996). W. S. Gilbert, A Classic Victorian & His Theatre. Oxford University Press. ISBN 0-19-816174-3. Sumption, Jonathan (1990). Hundred Years War Vol 1: Trial by Battle. Faber & Faber. p. 672. ISBN 978-0-571-26658-6. Vine, P.A.L (1990). Hampshire Waterways. Middleton Press. Webb, John (1989). The Spirit of Portsmouth: A History. Phillimore. ISBN 978-0-85033-617-7. Winton, John (1987). Warrior: The First and The Last. Liskeard, Cornwall: Maritime Books. ISBN 0-907771-34-3. The 2008 FA Cup Final was a football match held at Wembley Stadium on 17 May 2008 and was the final match of the 2007–08 FA Cup competition. The match was the 127th FA Cup Final, and the second to be held at the new Wembley Stadium since its redevelopment. The match was contested by Portsmouth and Cardiff City, with Portsmouth winning 1–0. This was the first time that the two sides have ever met in the competition. Both teams were aiming to win the FA Cup for the second time, Cardiff having won it in 1927 and Portsmouth in 1939. Had Cardiff won, they would have been the first club from outside the top division of English football to have won the competition since West Ham United in 1980. The match had an attendance of 89,874, a record which still stands as the largest ever for an FA Cup Final at the new Wembley Stadium. For winning the competition, Portsmouth received £1 million in prize money, as well as qualification to the 2008–09 UEFA Cup, their first foray into European football. It was suggested prior to the game that Cardiff City would not have been allowed to compete in the UEFA Cup had they beaten Portsmouth, as Football Association (FA) regulations previously meant Welsh clubs were ineligible for European competitions even if they won the FA Cup or League Cup, prompting UEFA to offer the possibility of Cardiff filling a wild-card slot in the UEFA Cup. However, the FA later issued a statement saying they would give their permission for Cardiff to participate in the UEFA Cup as one of England's representatives in the competition. As in the preceding few years, the players voted Player of the Round in every round from the First Qualifying Round to the Semi-finals were present and given VIP hospitality for themselves and a guest.The FA announced that, before the game began, the Welsh national anthem, "Hen Wlad Fy Nhadau", would be played, along with the traditional "God Save the Queen" and "Abide with Me". The Welsh anthem was sung by Katherine Jenkins, while Lesley Garrett sang "God Save the Queen" and the two duetted on "Abide with Me". Fratton Park is a football ground in the English city of Portsmouth in the United Kingdom. Fratton Park remains as the original home of Portsmouth F.C., who were founded on 5 April 1898. Uniquely, Fratton Park is currently the only stadium in English professional football that is not on the mainland island of Great Britain, as it is built on Portsea Island, where the city of Portsmouth is located. Fratton Park was built in 1899 on the site of a potato field in Milton, a farming village which later became a residential district of Portsmouth as the city expanded across Portsea Island during the twentieth century. Fratton Park's name was influenced by its convenience and closeness to Fratton railway station, one mile to the west of the stadium. Fratton Park was publicly opened on Tuesday 15 August 1899. The first ever football match at Fratton Park, on Wednesday 6 September 1899 was a 2-0 friendly win against Southampton FC, and was attended by 4,141 supporters.Fratton Park is affectionately known as "The Old Girl" by Portsmouth supporters. The stadium has also been branded in-house as "Fortress Fratton" in recent years. Her Majesty's Naval Base, Portsmouth (HMNB Portsmouth) is one of three operating bases in the United Kingdom for the Royal Navy (the others being HMNB Clyde and HMNB Devonport). Portsmouth Naval Base is part of the city of Portsmouth; it is located on the eastern shore of Portsmouth Harbour, north of the Solent and the Isle of Wight. Until the early 1970s, it was officially known as Portsmouth Royal Dockyard (or HM Dockyard, Portsmouth); thereafter the term 'Naval Base' gained currency, acknowledging a greater focus on personnel and support elements alongside the traditional emphasis on building, repairing and maintaining ships. In 1984 Portsmouth's Royal Dockyard function was downgraded and it was formally renamed the 'Fleet Maintenance and Repair Organisation' (FMRO). The FMRO was privatized in 1998 (and for a time (2002-2014) shipbuilding, in the form of block construction, returned). Around the year 2000, the designation HMS Nelson (which until then had been specific to Portsmouth's Naval Barracks in Queen Street) was extended to cover the entire base. The base is the headquarters for two-thirds of the Royal Navy's surface fleet, and employs up to 17,200 people. The base is also home to a number of commercial shore activities (including a ship repair facility operated by BAE Systems Maritime); naval logistics, accommodation and messing; and personnel support functions (e.g. medical and dental; education; pastoral and welfare) provided by Defence Equipment and Support. Portsmouth has built sections for, and will be home port to, the two new Royal Navy aircraft carriers, HMS Queen Elizabeth and HMS Prince of Wales. They required the harbour to be dredged to allow safe entry and exit. The project was intended to secure the base's future for the next forty years and would revitalise shipbuilding in the city; but, due to budget cuts in 2013 shipbuilding in Portsmouth was closed in favour of BAE keeping its yards in Glasgow open. It has been speculated this was to help retain Scotland in the union during the 2014 Scottish independence referendum and it has been suggested by the BAE chairman that shipbuilding could return to the city if Scotland voted for independence.Portsmouth naval base is the oldest in the Royal Navy, and it has been an important part of the Senior Service's history and the defence of the British Isles for centuries. At one time it was the largest industrial site in the world. It is home to one of the oldest drydocks in the world. The former Block Mills are of international significance, having been the first factory in the world to employ steam-powered machine tools for mass production. In 1985 a partnership between the Ministry of Defence and Portsmouth City Council created the Portsmouth Naval Base Property Trust to manage part of the historic south-west corner of the Naval Base, under a 99-year lease, as a heritage area: Portsmouth Historic Dockyard. It allows members of the public to visit important maritime attractions such as Mary Rose, HMS Victory and HMS Warrior. Hampshire (, (listen); abbreviated Hants) is a county on the southern coast of England. The county town is the city of Winchester. Its two largest cities, Southampton and Portsmouth, are administered separately as unitary authorities; the rest of the county is governed by Hampshire County Council. First settled about 14,000 years ago, Hampshire's history dates to Roman Britain, when its chief town was Winchester. When the Romans left Britain, the area was infiltrated by tribes from Scandinavia and mainland Europe, principally in the river valleys. The county was recorded in the 11th century Domesday Book, divided into 44 hundreds. From the 12th century, the ports grew in importance, fuelled by trade with the continent, wool and cloth manufacture in the county, and the fishing industry, and a shipbuilding industry was established. By the 16th century, the population of Southampton had outstripped that of Winchester. By the mid-19th century, with the county's population at 219,210 (double that at the beginning of the century) in more than 86,000 dwellings, agriculture was the principal industry and 10 per cent of the county was still forest. Hampshire played a crucial military role in both World Wars. 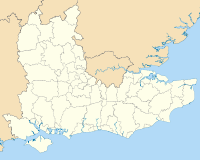 The Isle of Wight left the county to form its own in 1974. The county's geography is varied, with upland to 286 metres (938 ft) and mostly south-flowing rivers. There are areas of downland and marsh, and two national parks: the New Forest, and part of the South Downs, which together cover 45 per cent of Hampshire. Hampshire is one of the most affluent counties in the country, with an unemployment rate lower than the national average, and its economy derived from major companies, maritime, agriculture and tourism. Tourist attractions include many seaside resorts, the national parks and the Southampton Boat Show. The county is known as the home of writers Jane Austen and Charles Dickens, the childhood home of Florence Nightingale and the birthplace of engineer Isambard Kingdom Brunel. Henry James Redknapp (born 2 March 1947) is an English football manager. He has previously managed AFC Bournemouth, West Ham United, Portsmouth, Southampton, Tottenham Hotspur, Queens Park Rangers and Birmingham City. In his second spell at Portsmouth, he managed the side that won the 2008 FA Cup. At the conclusion of the 2009–10 season, he guided Tottenham into the UEFA Champions League.His son, Jamie Redknapp, played under him at Bournemouth and Southampton. He is also uncle to Frank Lampard, who played under him at West Ham United. This is a list of the National Register of Historic Places listings in Portsmouth, Virginia. This is intended to be a complete list of the properties and districts on the National Register of Historic Places in the independent city of Portsmouth, Virginia, United States. The locations of National Register properties and districts for which the latitude and longitude coordinates are included below, may be seen in a Google map.There are 22 properties and districts listed on the National Register in the city, including 2 National Historic Landmarks. Another property was once listed but has been removed. Peter James Crouch (born 30 January 1981) is an English professional footballer who plays as a striker for Premier League club Burnley. He was capped 42 times by the England national team between 2005 and 2010, scoring 22 goals for his country in that time, and appearing at two World Cups.Crouch is one of 28 players to have scored 100 or more Premier League goals, holding the record for the most headed goals in Premier League history.Crouch began his career as a trainee with Tottenham Hotspur. He failed to make an appearance for Spurs and after loan spells at Dulwich Hamlet and Swedish club IFK Hässleholm he joined Queens Park Rangers. After QPR were relegated at the end of the 2000–01 season, Portsmouth acquired him on a transfer deal worth £1.5 million. He had a strong first season at Fratton Park, and after scoring 19 goals for the club, he joined Aston Villa in March 2002 for £5 million. He had a relatively poor spell at Villa, however, and was loaned out to Norwich City in 2003 before making a move to Southampton, where he regained his form, which would ultimately prompt his joining Liverpool in July 2005. At Liverpool he enjoyed considerable success, winning the FA Cup and FA Community Shield in 2006, and also gaining a runners-up medal in the 2007 UEFA Champions League Final. After scoring 42 goals in three seasons at Anfield, Portsmouth re-acquired Crouch for £11 million, where he forged an effective partnership with fellow England international Jermain Defoe. He spent just one season in his second spell at Portsmouth and left for Tottenham Hotspur, where he again linked up with Defoe and Harry Redknapp. He scored a vital goal for Tottenham against Manchester City which earned the club a place in the UEFA Champions League. He scored seven goals in ten European matches for Spurs in 2010–11, but was unable to replicate this form in the Premier League. He joined Stoke City in August 2011, for a club record fee of £10 million. In his first season with Stoke, he scored 14 goals and won the club's Player of the Year award. He scored eight in 2012–13 and then hit ten in both the 2013–14 and 2014–15 seasons. Crouch spent seven-and-a-half years with Stoke, scoring 62 goals before joining Burnley in January 2019. The Piscataqua River () is a 12-mile-long (19 km) tidal river forming the boundary of the U.S. states of New Hampshire and Maine from its origin at the confluence of the Salmon Falls River and Cocheco River. The drainage basin of the river is approximately 1,495 square miles (3,870 km2), including the subwatersheds of the Great Works River and the five rivers flowing into Great Bay: the Bellamy, Oyster, Lamprey, Squamscott, and Winnicut. The river runs southeastward, with New Hampshire to the south and west and Maine to the north and east, and empties into the Gulf of Maine east of Portsmouth, New Hampshire. The last 6 miles (10 km) before the sea are known as Portsmouth Harbor and have a tidal current of around 4 knots (7.4 km/h; 4.6 mph). The cities/towns of Portsmouth, New Castle, Newington, Kittery and Eliot have developed around the harbor. Portsmouth is a city in Rockingham County, New Hampshire, United States. As of the 2010 census it had a population of 21,233, and in 2017 the estimated population was 21,796. A historic seaport and popular summer tourist destination on the Piscataqua River bordering the state of Maine, Portsmouth was formerly the home of the Strategic Air Command's Pease Air Force Base, since converted to Portsmouth International Airport at Pease. Portsmouth is a city in and the county seat of Scioto County, Ohio, United States. Located in southern Ohio 41 miles (66 km) south of Chillicothe, it lies on the north bank of the Ohio River, across from Kentucky, just east of the mouth of the Scioto River. The population was 20,226 at the 2010 census. Portsmouth is a town in Newport County, Rhode Island. The population was 17,389 at the 2010 U.S. Census. Portsmouth is the second oldest municipality in Rhode Island, after Providence; it was one of the four colonies which merged to form the Colony of Rhode Island and Providence Plantations, the others being Providence, Newport, and Warwick. Portsmouth is an independent city in the Commonwealth of Virginia. As of the 2010 census, the population was 95,535. It is part of the Hampton Roads metropolitan area. The Norfolk Naval Shipyard, often called the Norfolk Navy Yard, is a historic and active U.S. Navy facility that is actually located in Portsmouth rather than Norfolk; the original name "Gosport" was changed to "Norfolk" to reflect its location in what is now the former Norfolk County, Virginia. The shipyard upgrades, remodels, and repairs ships of the US Navy and is one of the few facilities in the world with the capability to dry dock an aircraft carrier. Directly opposite Norfolk, the city of Portsmouth also has miles of waterfront land on the Elizabeth River as part of the harbor of Hampton Roads. There is a ferry boat that takes riders back and forth across the water between downtown Norfolk and the Portsmouth Olde Towne Historic District. The Portsmouth Earthworks are a large prehistoric mound complex constructed by the Ohio Hopewell culture mound builder indigenous peoples of eastern North America (100 BCE to 500 CE). The site was one of the largest earthwork ceremonial centers constructed by the Hopewell and is located at the confluence of the Scioto and Ohio Rivers, in present-day Ohio. The majority of the mound complex site is now covered by the city of Portsmouth in Scioto County, Ohio. Several individual sections of the complex have been included on the National Register of Historic Places. Portsmouth Football Club (listen) is an English professional association football club in Portsmouth, Hampshire, which plays in EFL League One, the third tier of English football. The club was founded on 5 April 1898 and home matches are played at Fratton Park in Milton, Portsmouth. Portsmouth have been the top tier Football League Champions of England twice consecutively in 1949 and 1950. Portsmouth have also won the FA Cup twice in 1939 and 2008, the FA Charity Shield once in 1949 and the EFL Trophy once in 2019.Portsmouth have also won the second tier division title once in 2002–03, the third tier division title three times in 1923–24 (South), 1961–62, 1982–83 and the fourth tier division title once in 2016–17. In the early twentieth century, Portsmouth were also champions of the Southern Football League in 1901–02 and 1919–20. Portsmouth were also champions of the Western Football League in 1900–01, 1901–02 and 1902–03. These, and their more recent wins, make Portsmouth southern England’s most successful club (in terms of cups, honours and titles) outside of London. Portsmouth have played in European competition for only one season in their history, the 2008–09 UEFA Cup (now UEFA Europa League), a result of winning the 2008 FA Cup Final. In this period, the club had international footballers including England players Glen Johnson, Jermain Defoe, Peter Crouch, David James and Sol Campbell. Between 2003 and 2010 the club spent seven consecutive seasons in the Premier League. The club's fortunes declined in 2010–13 when the club entered administration twice and were relegated three times, reaching the fourth tier (EFL League Two) and their lowest point since the 1979–80 season. The club were saved from liquidation after being bought out by the fan-owned Pompey Supporters Trust (PST). This made Portsmouth the largest fan-owned football club in England until 3 August 2017, when the PST sold it to The Tornante Company, an investment company owned by former Disney CEO Michael Eisner.During the last few months of the PST's ownership, Portsmouth were promoted to EFL League One after winning the fourth tier EFL League Two divisional championship title on 6 May 2017 in the final league game of the 2016–17 season. Portsmouth then became only the fifth English football club to win all four tiers of current English professional football (after Wolves, Burnley, Preston North End and Sheffield United). In addition, Portsmouth are also one of only two English football clubs to have been champions of five professional divisions including the former regional Football League Third Division South championship in the 1923–24 season. Wolverhampton Wanderers also share this distinction, having won all four divisions, plus a Football League Third Division North title win, coincidentally in the same 1923–24 season as Portsmouth won the respective South division. The Portsmouth Naval Shipyard (PNS), often called the Portsmouth Navy Yard, is a United States Navy shipyard located in Kittery on the southern boundary of Maine near the city of Portsmouth, New Hampshire. PNS is tasked with the overhaul, repair, and modernization of US Navy submarines. The facility is sometimes confused with the Norfolk Naval Shipyard in Portsmouth, Virginia. Scioto County is a county located along the Ohio River in the south central region of the U.S. state of Ohio. As of the 2010 census, the population was 79,499. Its county seat is Portsmouth. The county was founded March 24, 1803 from Adams County and is named for an Indian word referring to deer or deer-hunting.Scioto County comprises the Portsmouth, OH Micropolitan Statistical Area. It is located at the confluence of the Scioto and Ohio rivers. The Treaty of Portsmouth formally ended the 1904–05 Russo-Japanese War. It was signed on September 5, 1905 after negotiations lasting from August 6 to August 30, at the Portsmouth Naval Shipyard in Kittery, Maine, United States. U.S. President Theodore Roosevelt was instrumental in the negotiations and won the Nobel Peace Prize for his efforts. United States Lightship 101, known as Portsmouth, was first stationed at Cape Charles, Virginia. Today she is at the Portsmouth Naval Shipyard Museum in Portsmouth, Virginia. Portsmouth never had a lightship station, however when the vessel was dry docked there as a museum, she took on the pseudo-name, Portsmouth. A National Historic Landmark, she is one of a small number of surviving lightships. The University of Portsmouth is a public university in the city of Portsmouth, Hampshire, England. The history of the university dates back to 1908, when the Park building opened as a Municipal college and public library. It was previously known as Portsmouth Polytechnic until 1992, when it was granted university status through the Further and Higher Education Act 1992. It is ranked among the Top 100 universities under 50 in the world. The university offers a range of disciplines, from Pharmacy, International relations and politics, to Mechanical Engineering, Paleontology, Criminology, Criminal Justice, among others. The Guardian University Guide 2018 ranked its Sports Science number one in England, while Criminology, English, Social Work, Graphic Design and Fashion and Textiles courses are all in the top 10 across all universities in the UK. Furthermore, 89% of its research conducted in Physics, and 90% of its research in Allied Health Professions (e.g. Dentistry, Nursing and Pharmacy) have been rated as world-leading or internationally excellent in the most recent Research Excellence Framework (REF2014).The University is a member of the University Alliance and The Channel Islands Universities Consortium. Alumni include Tim Peake, Grayson Perry, Simon Armitage and Ben Fogle. Portsmouth was named the UK's most affordable city for students in the Natwest Student Living Index 2016. On Friday 4 May 2018, the University of Portsmouth was revealed as the main shirt sponsor of Portsmouth F.C. for the 2018–19, 2019–20 and 2020–21 seasons.